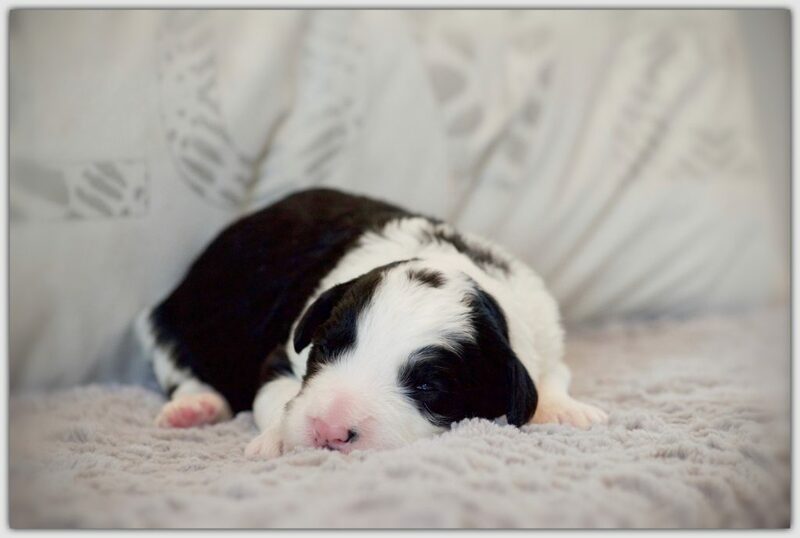 Sarah and Marlin have given us their first litter together. 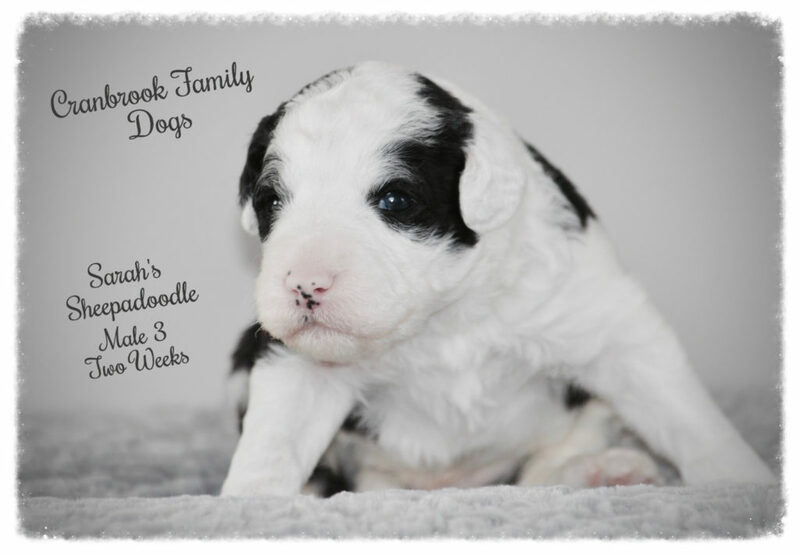 We have 6 handsome boys and one lovely girl. 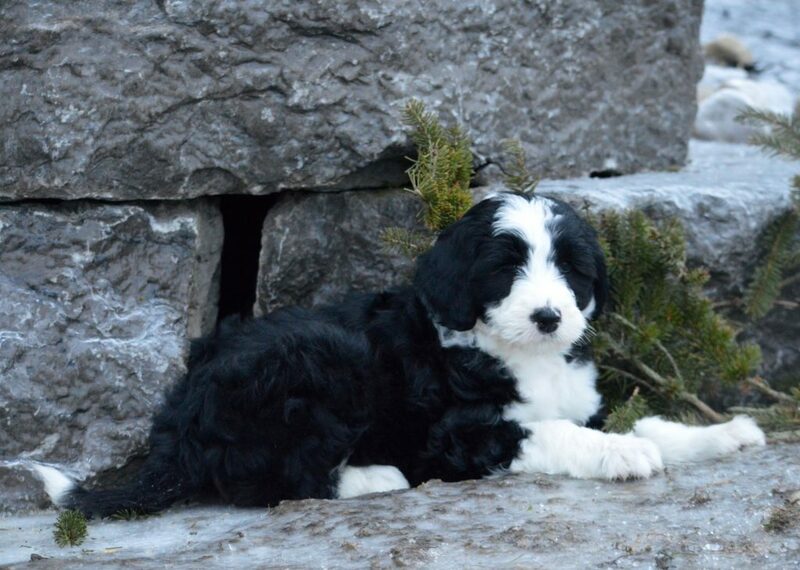 These pups will be fun, outgoing, affectionate and playful. 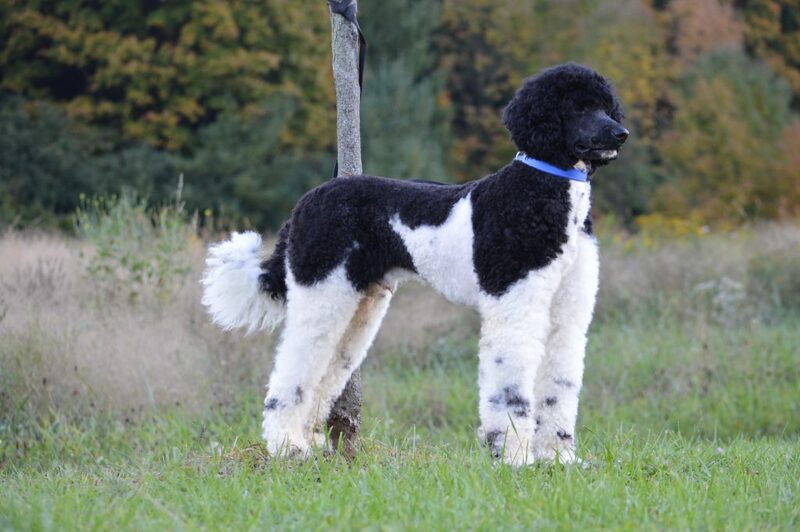 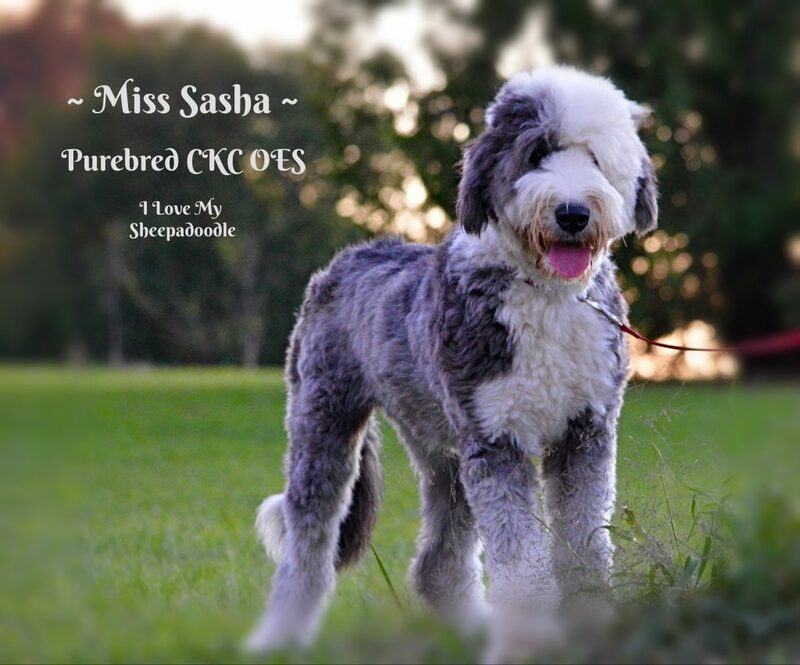 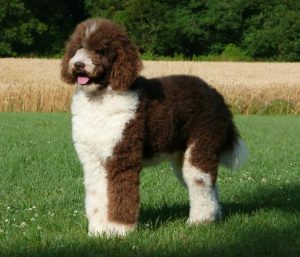 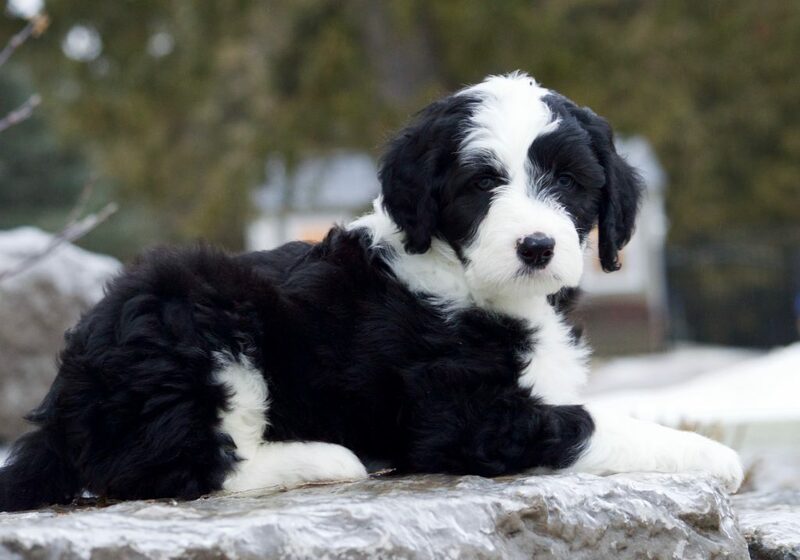 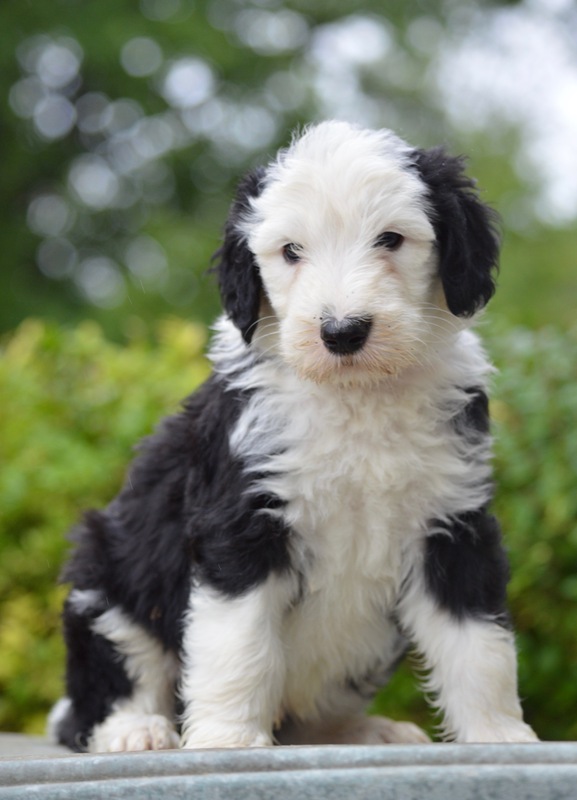 The Sheepadoodle is a fun loving, loyal dog. 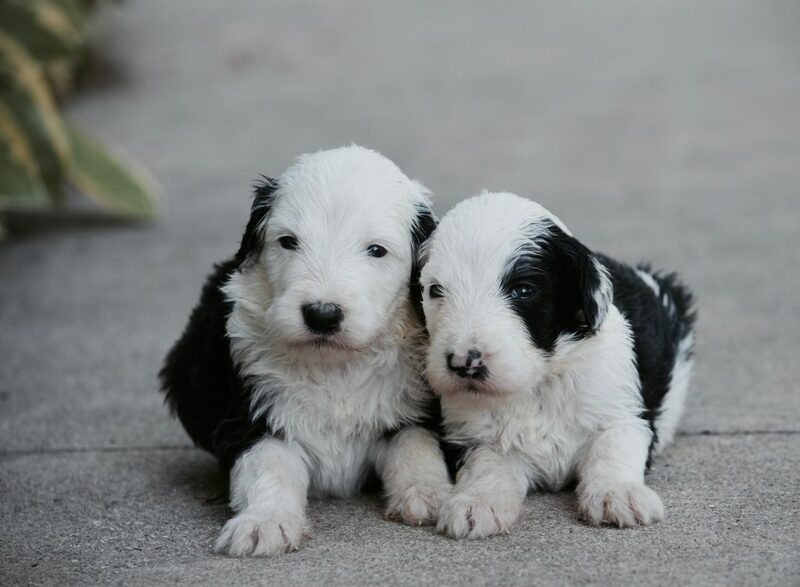 These pups have very nice markings. 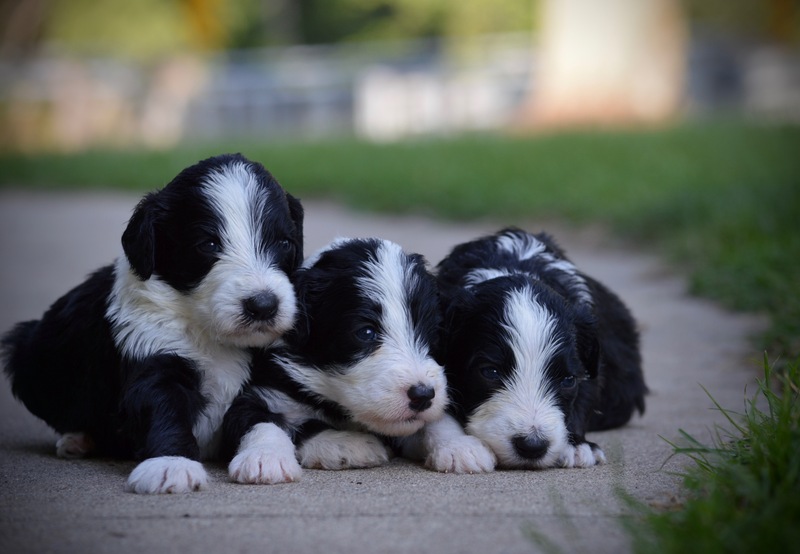 They will likely be more bulky. 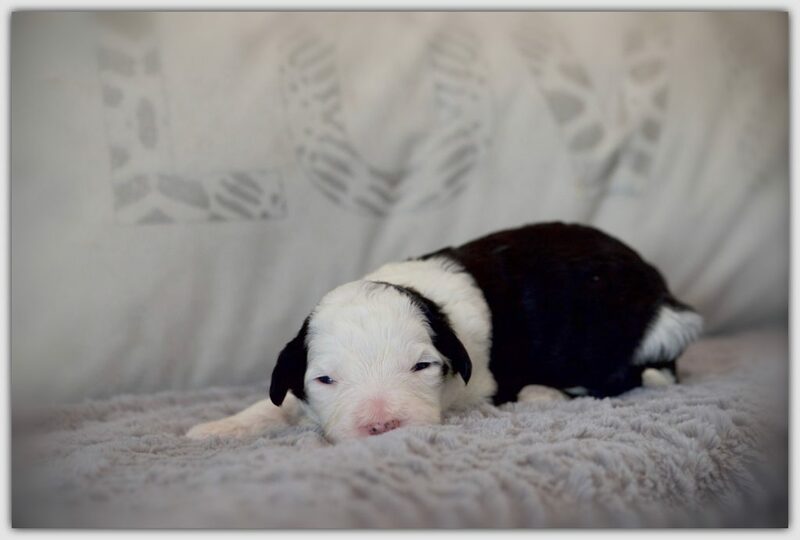 Sarah’s pups tend to have a blockier build to them. 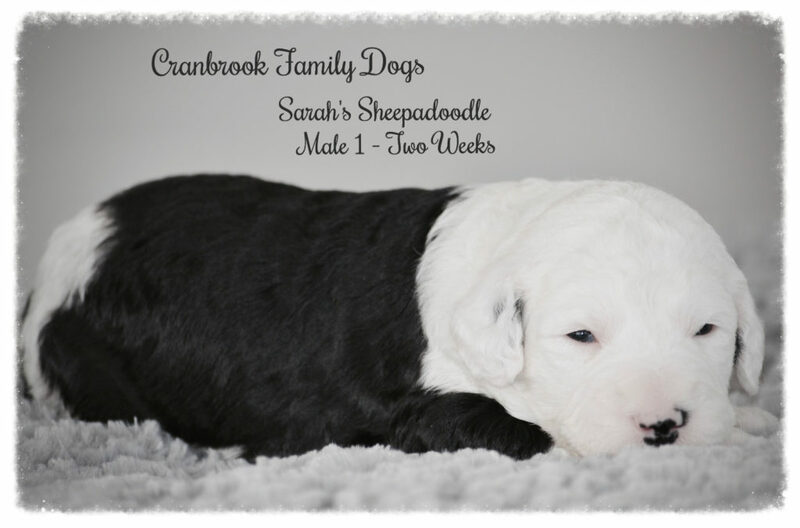 I expect these pups to mature to around 60 – 65 lbs. 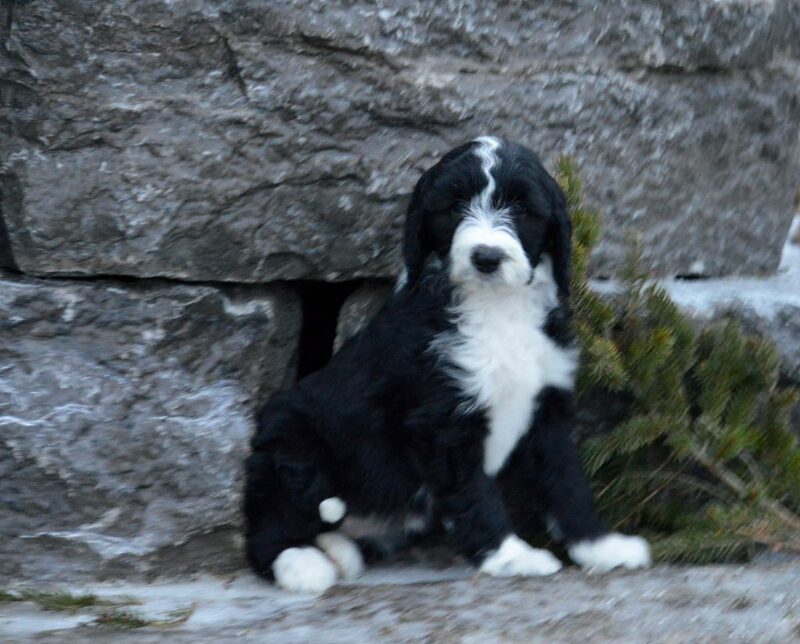 The pups will be ready to go March 8th or after. 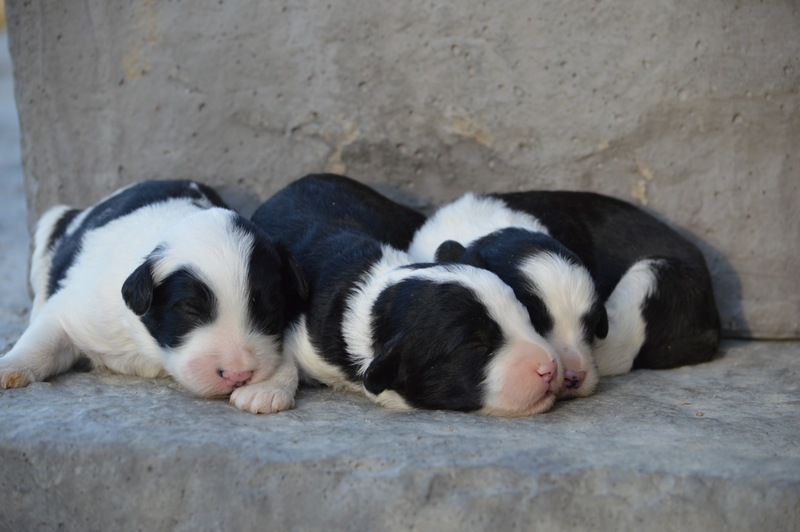 They come with their first set of vaccines, a health check from our vet, several rounds of dewormer and a take home puppy pack. 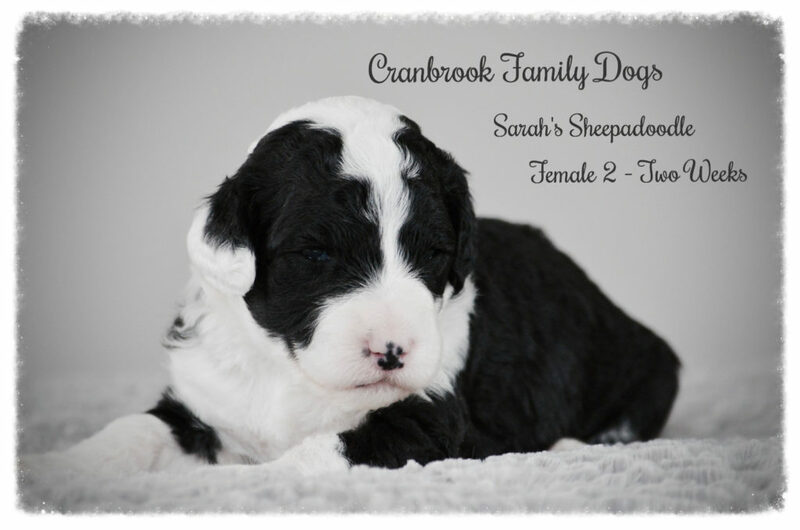 These pups are priced at $2,500 CD taxes included. 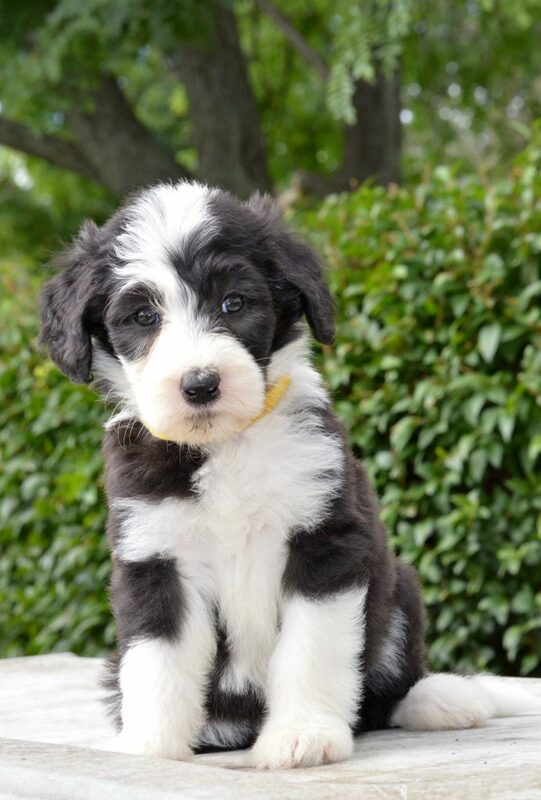 Feel free to fill out our online puppy application if you are interested in a pup. 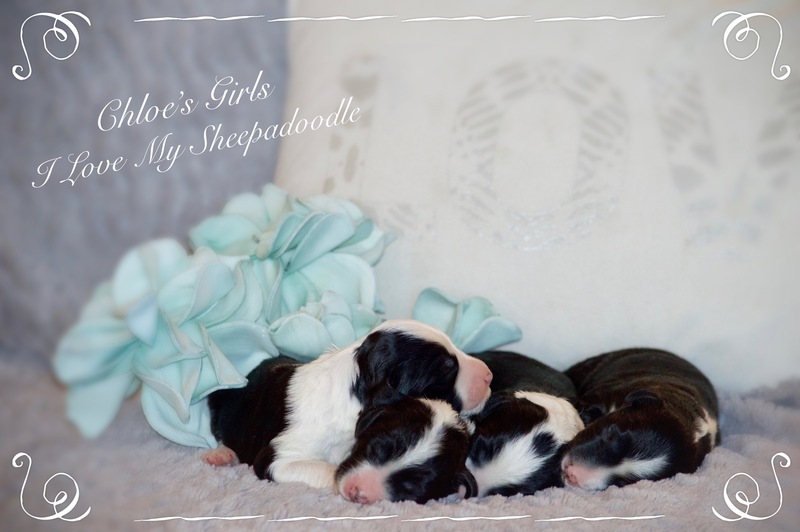 Deposits are $500 to hold a pup to your name and goes towards puppy purchase. 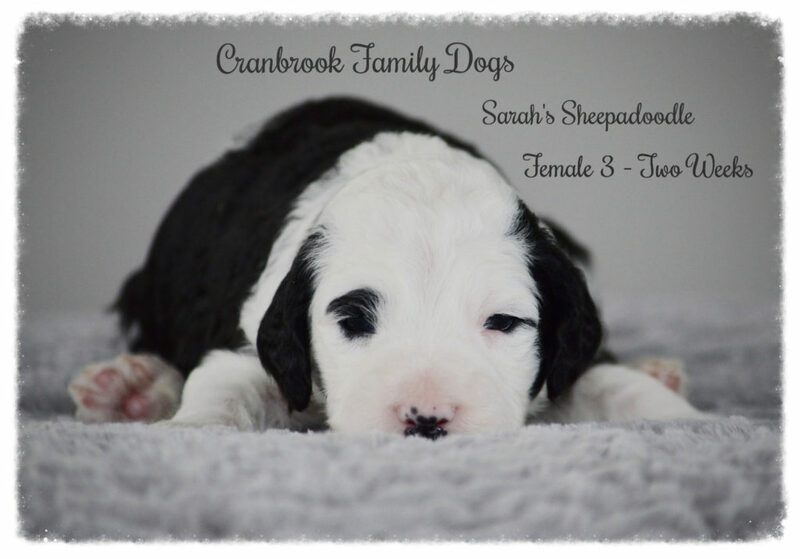 These pups are available! 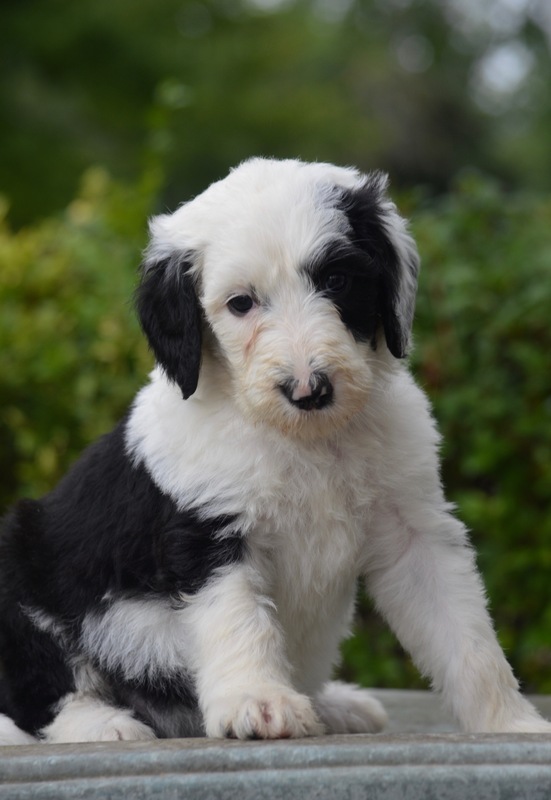 If you are interested in one of these Sheepadoodle pups please fill out our online puppy application. 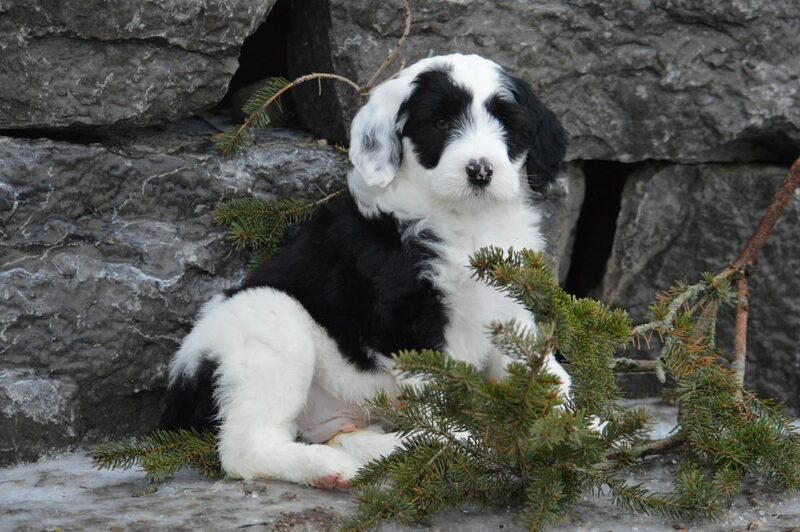 She is sweet, affectionate, low to medium energy and ready to become someones special buddy! 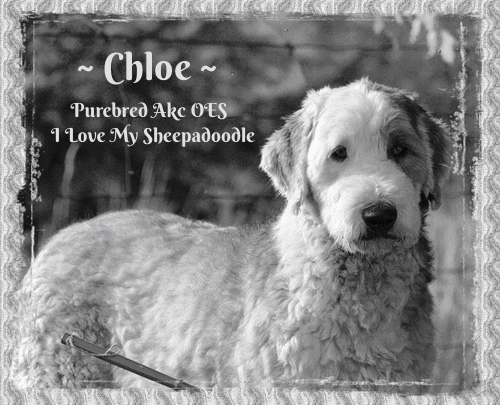 Chloe and King have had their first litter of F1 Standard Sheepadoodles. 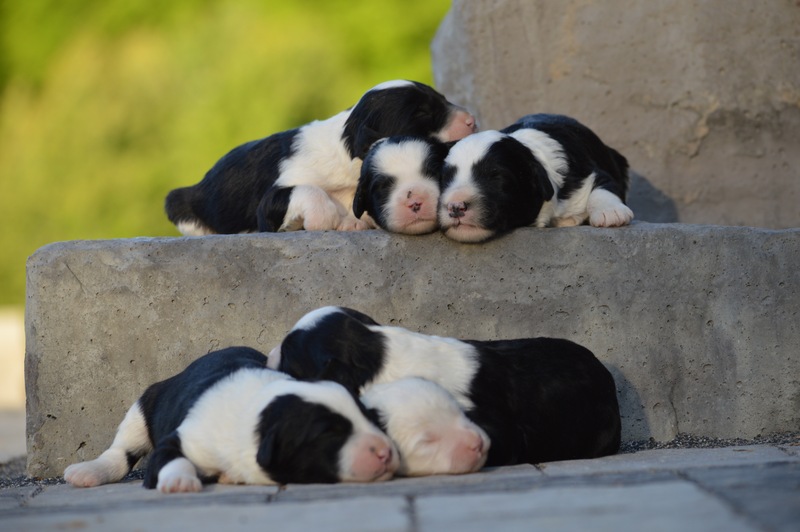 And what a litter they have made! 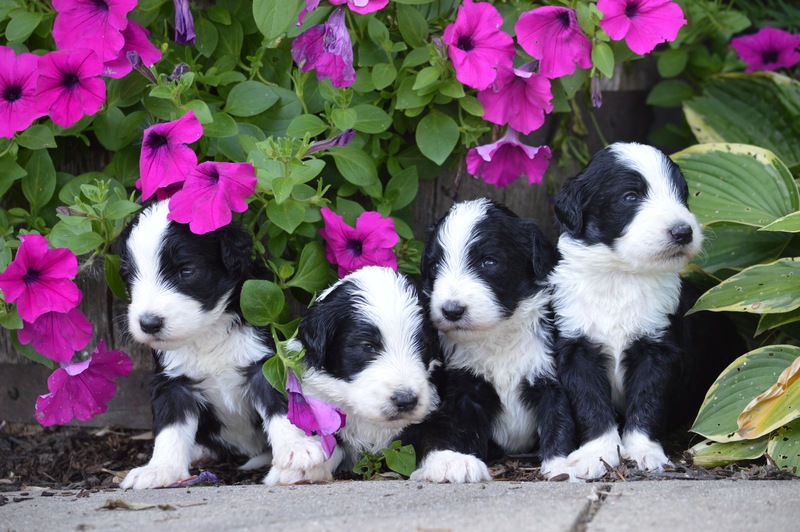 There are nine adorable boys and four sweet girls. 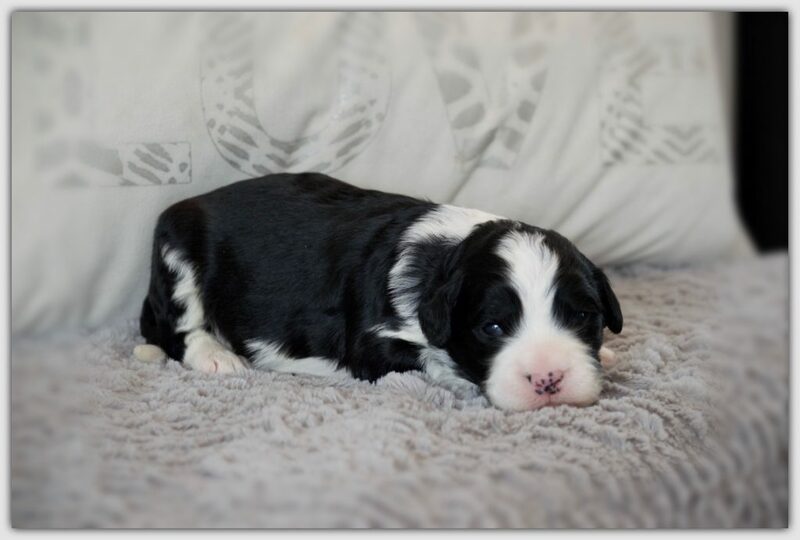 Lots of options in this litter! 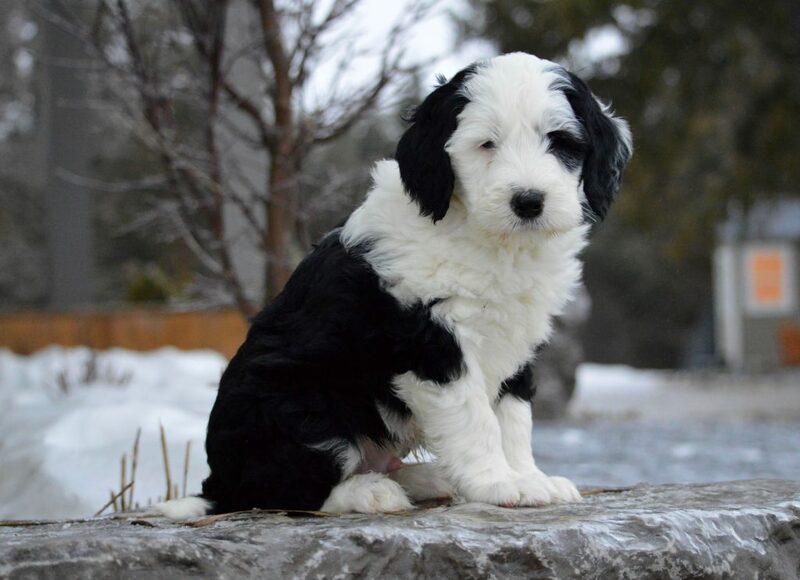 These pups should have nice full, wavy coats. 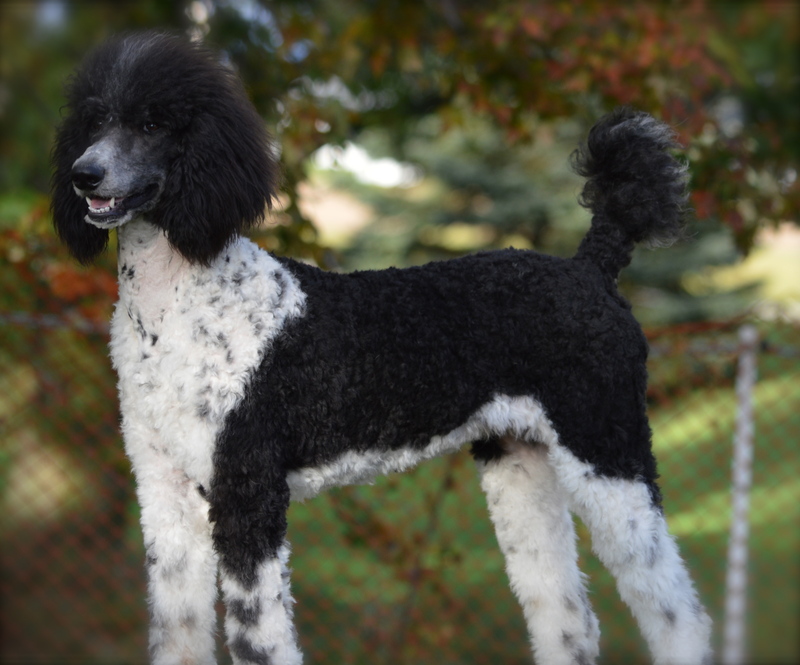 There will be some light shedding to no shedding in the puppies. 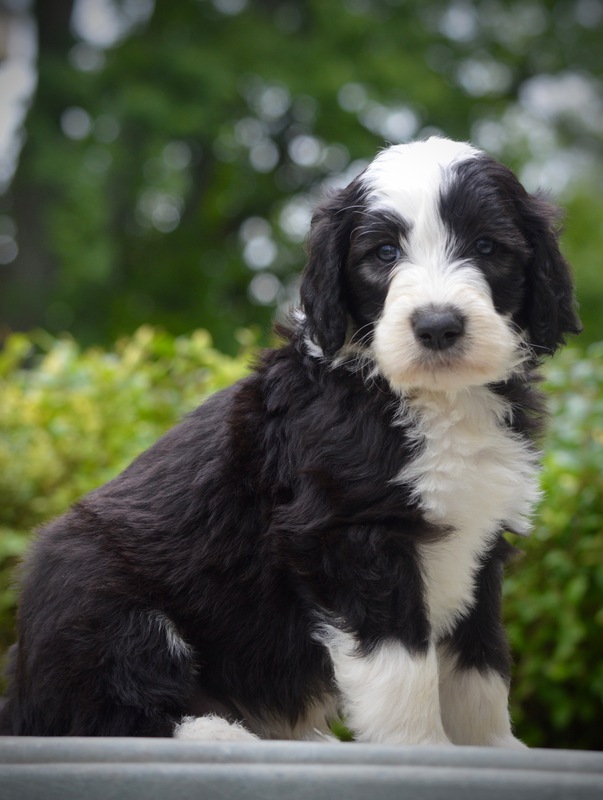 These puppies will mature to around 60-75 lbs – one of our largest sized pups! 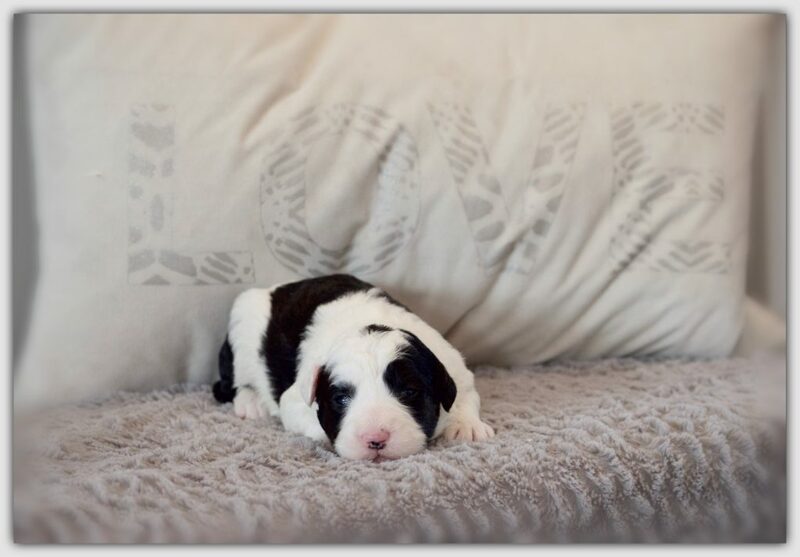 If you are interested in one of our puppies, contact us or fill out our online puppy application. 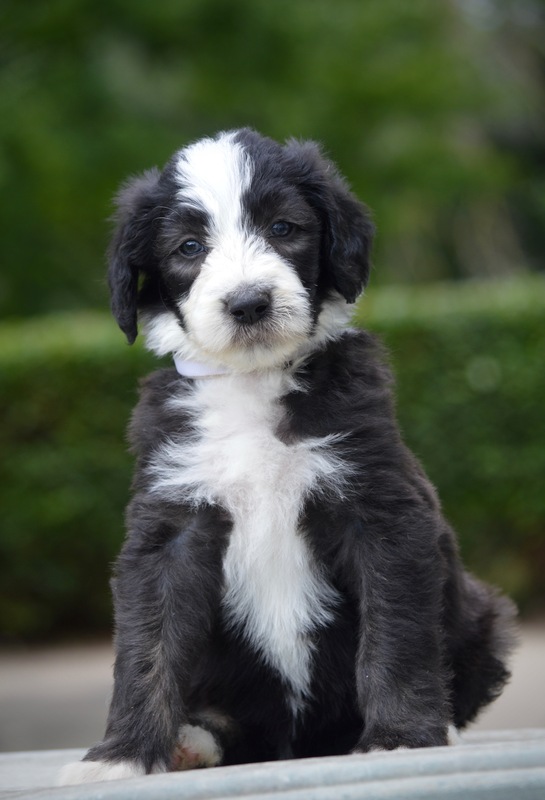 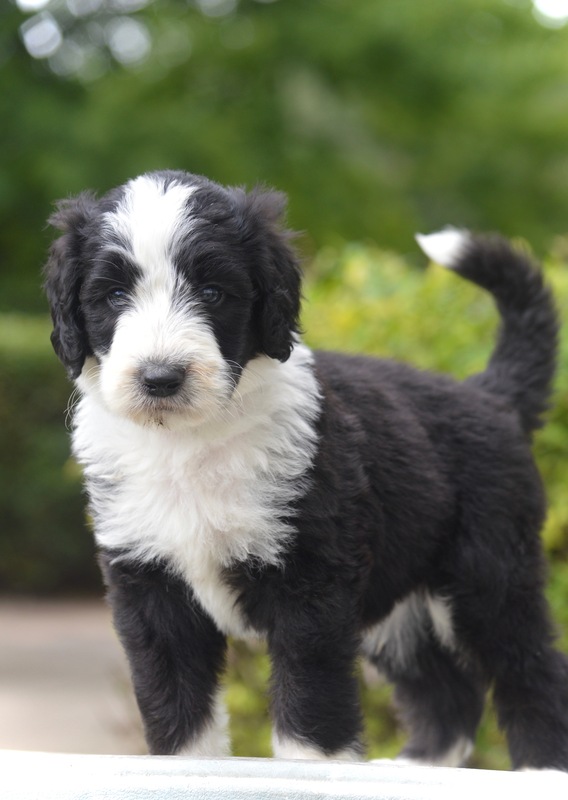 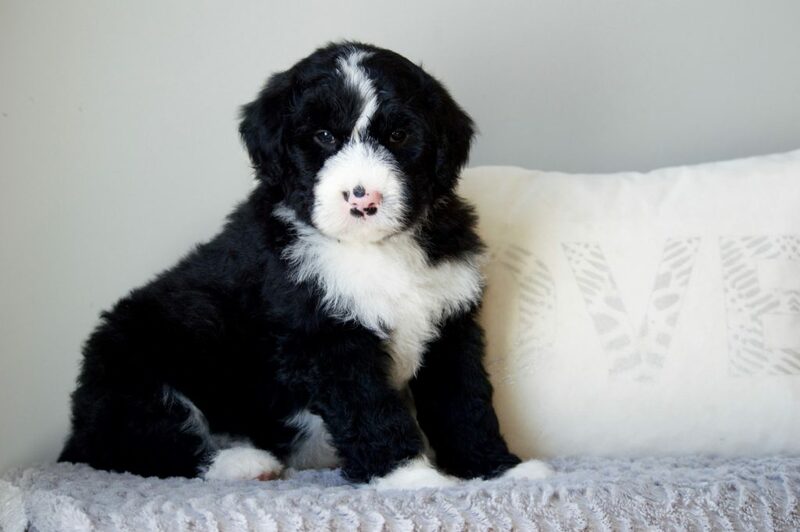 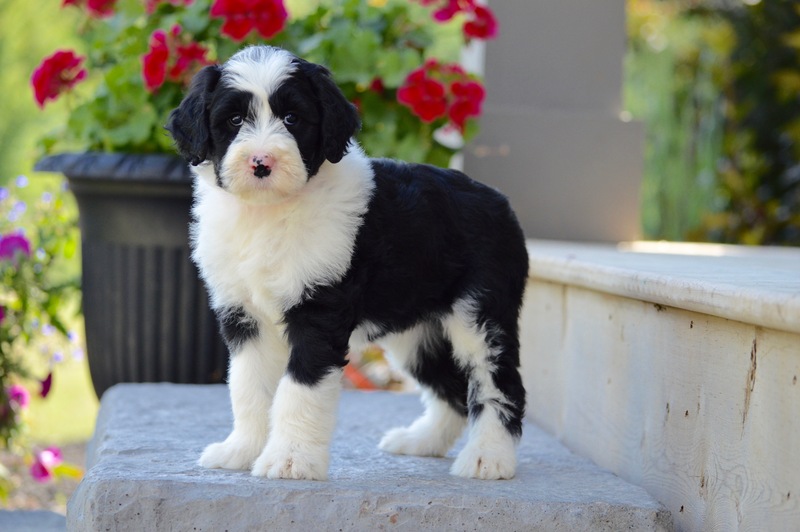 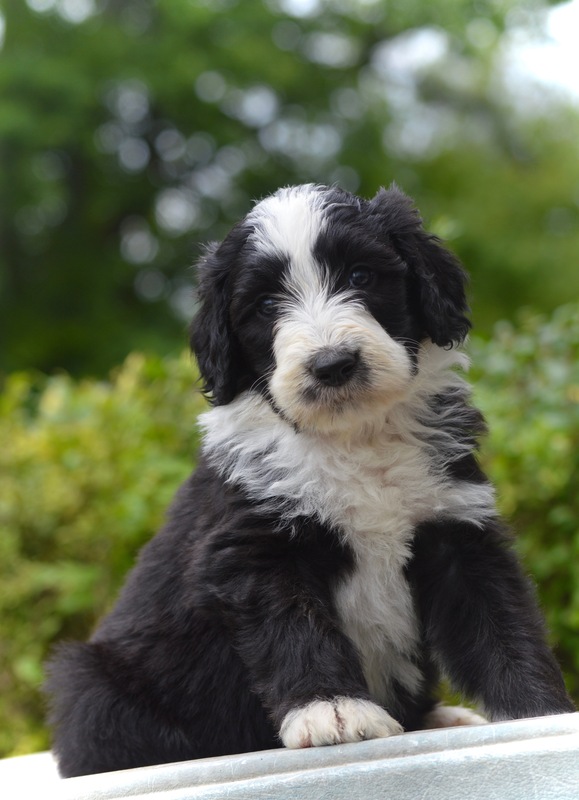 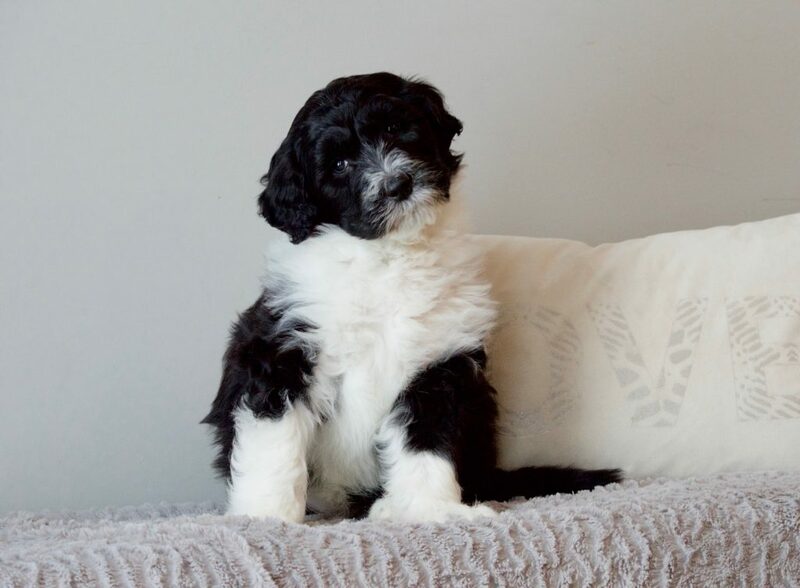 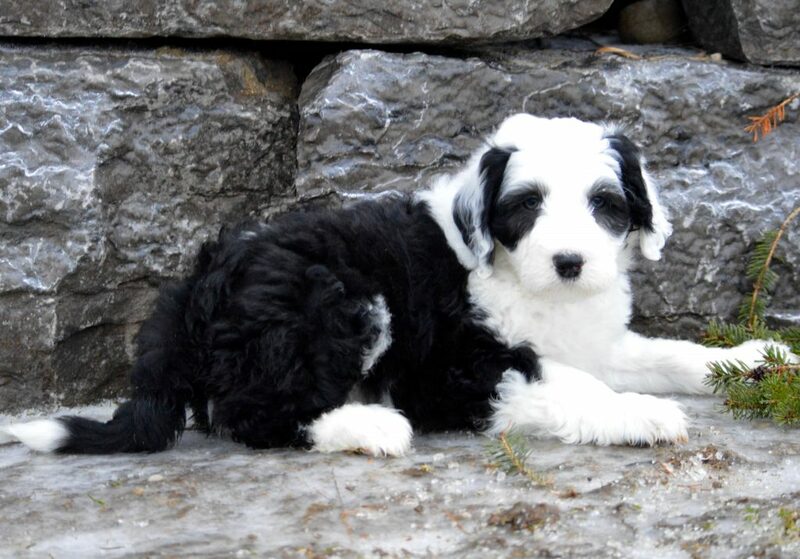 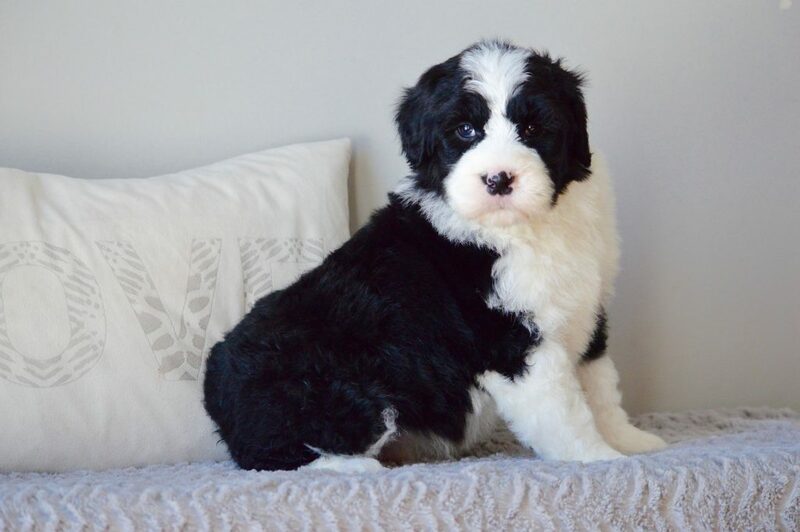 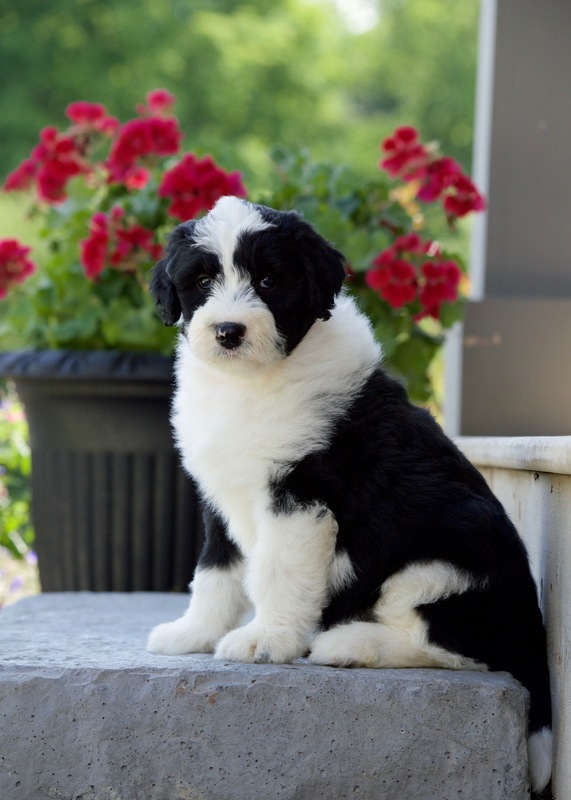 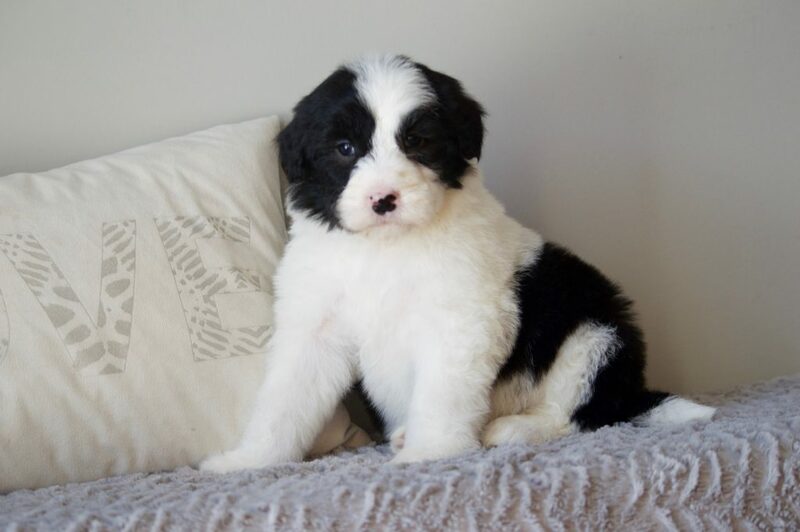 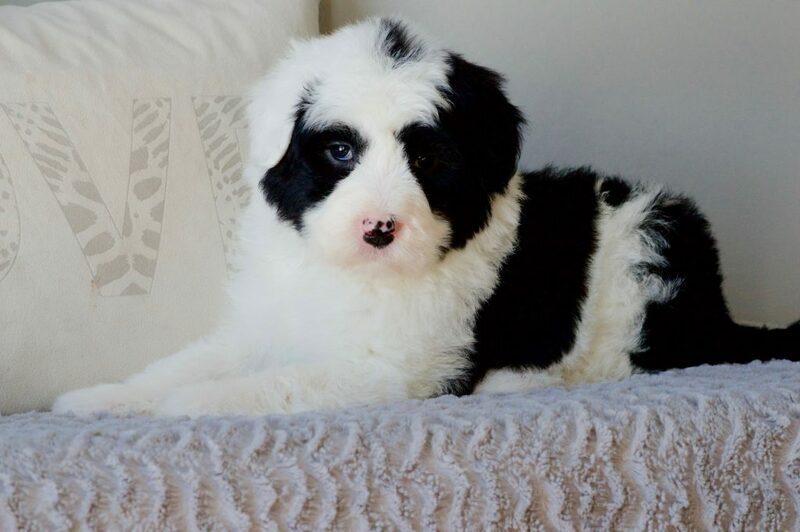 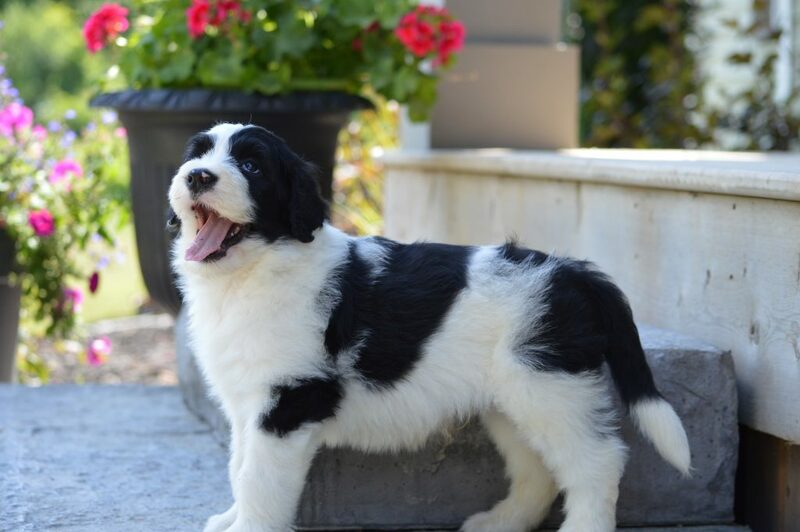 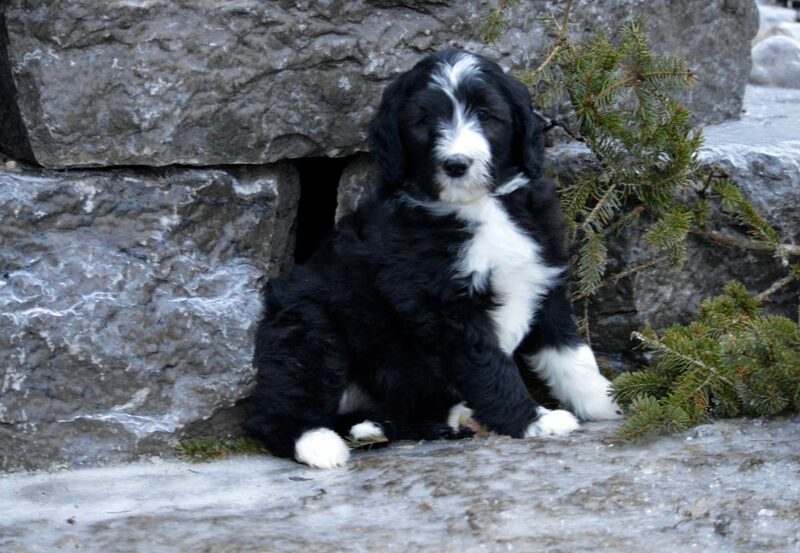 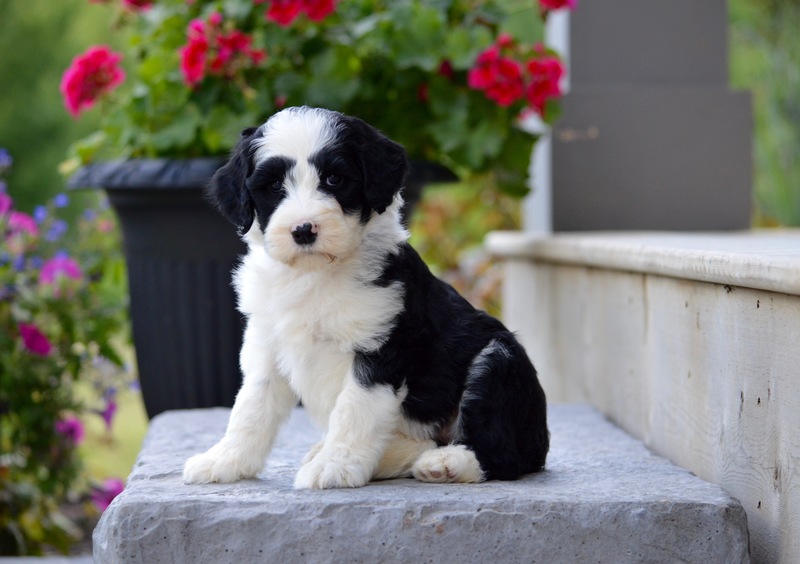 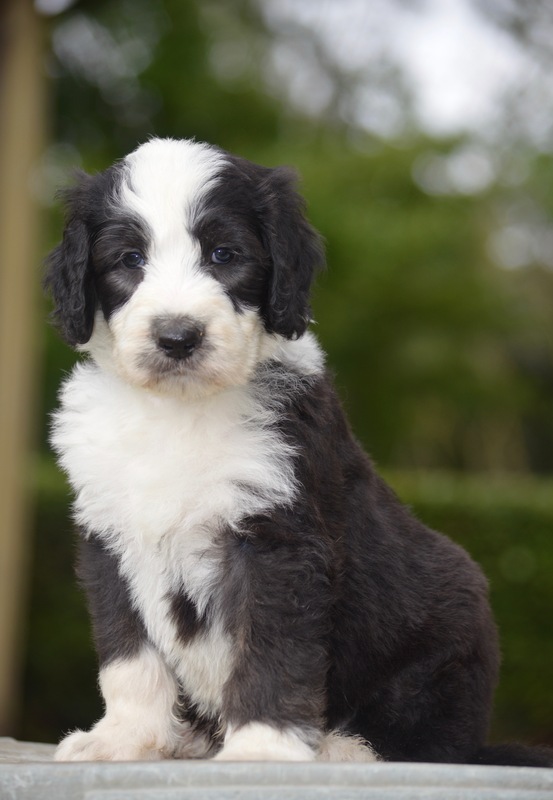 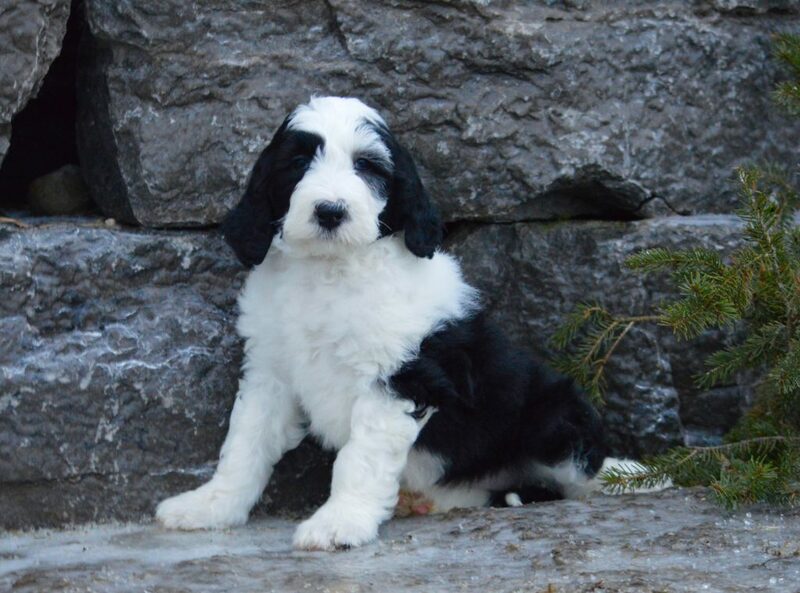 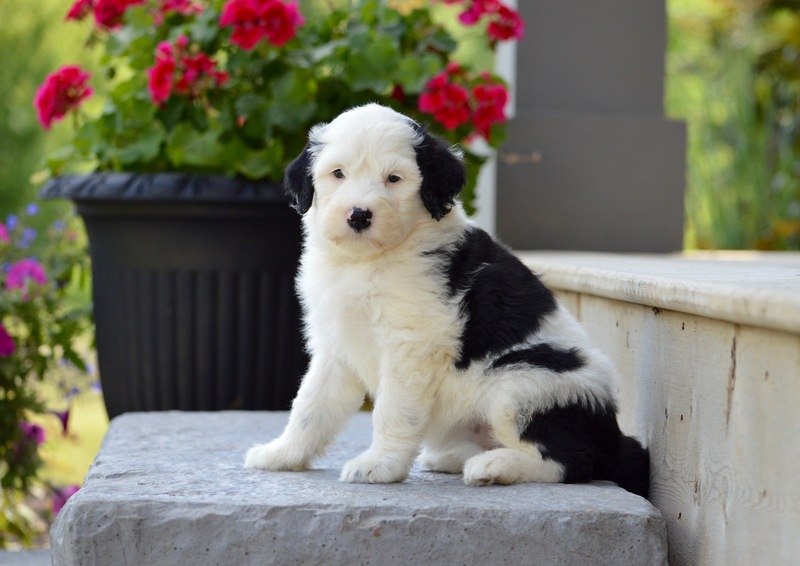 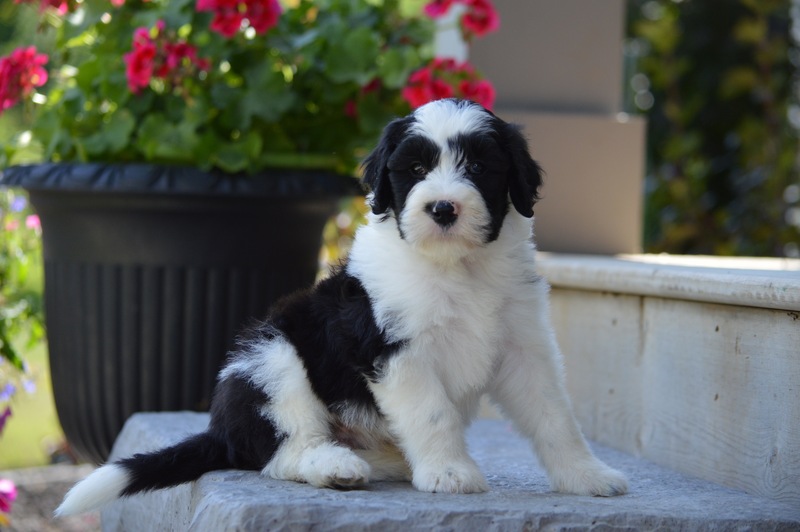 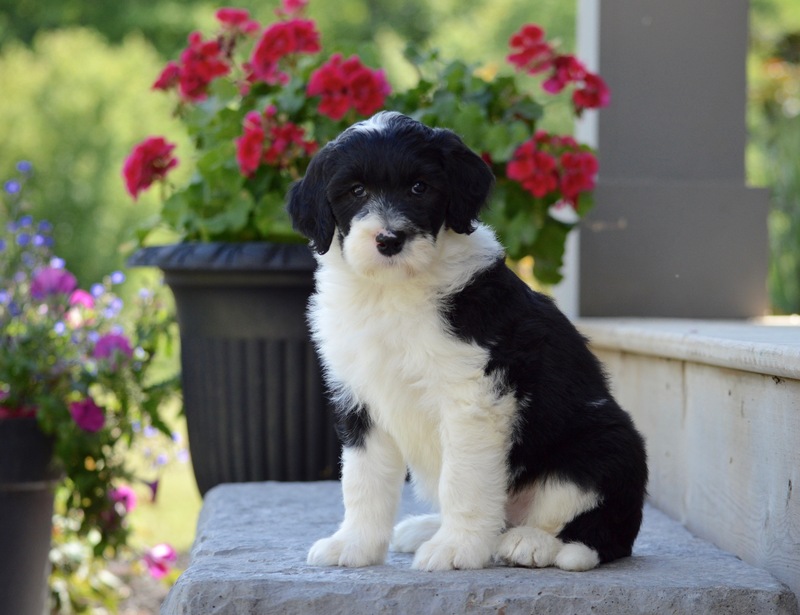 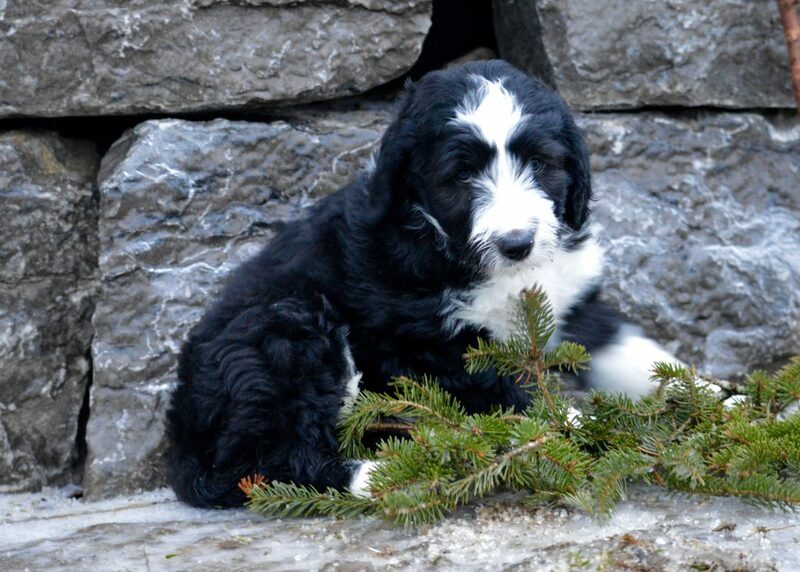 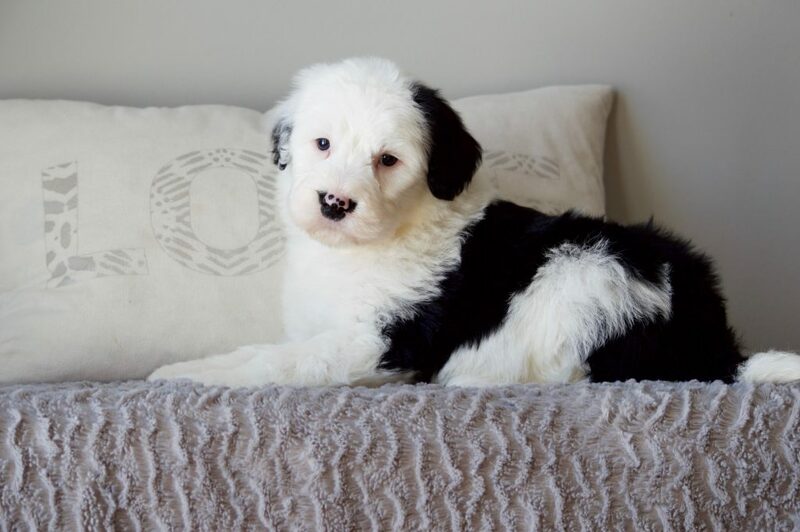 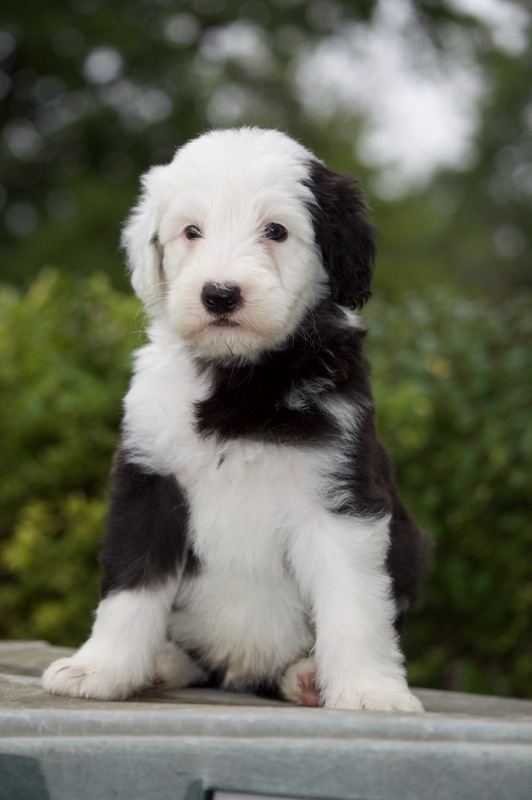 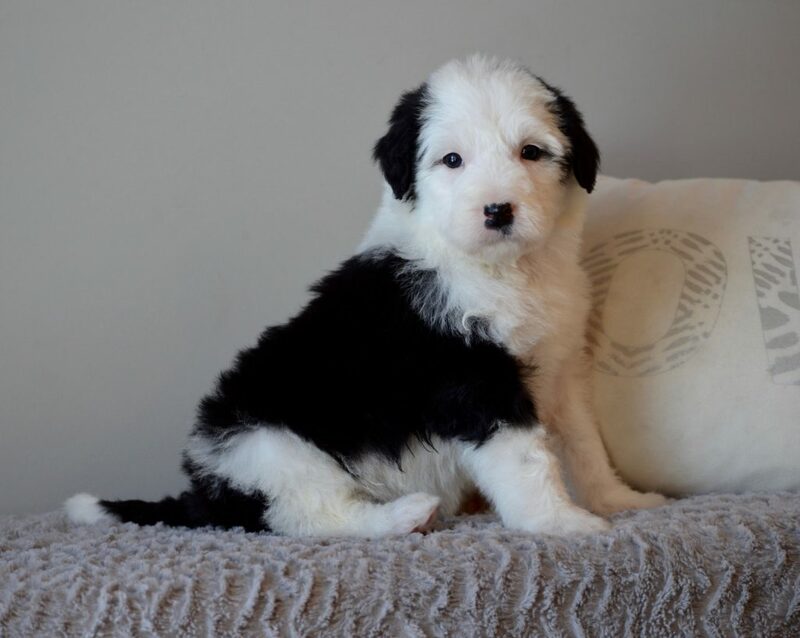 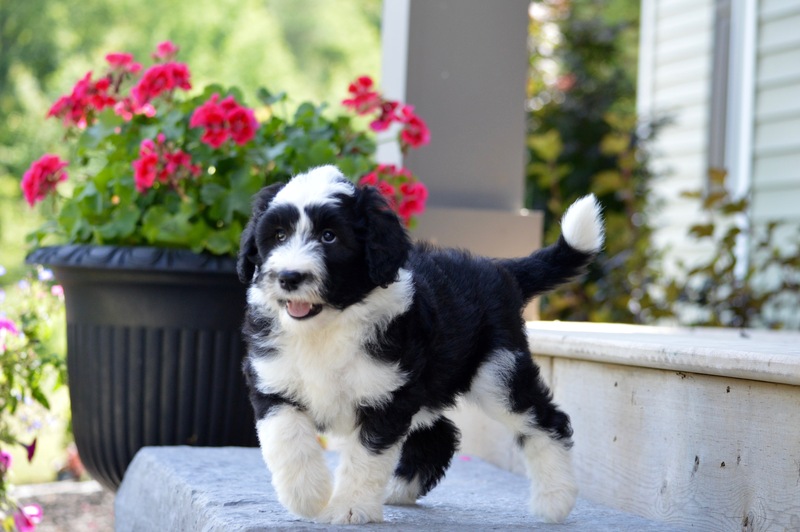 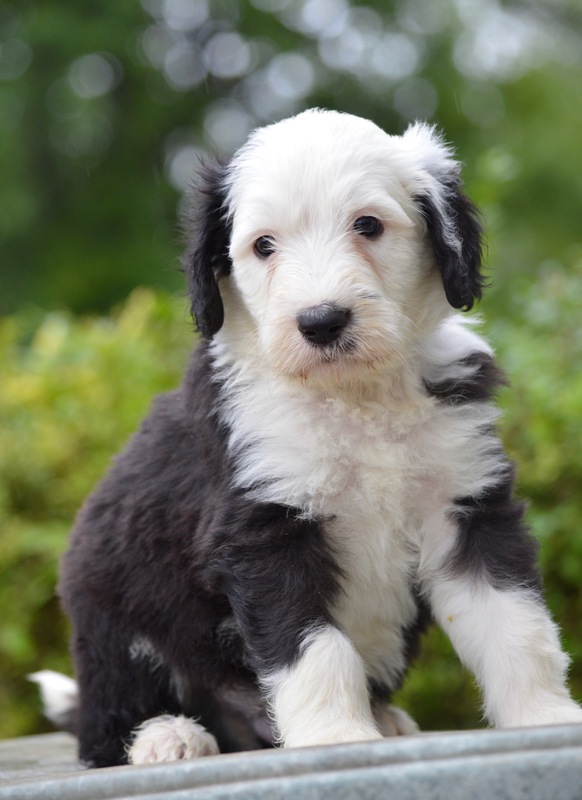 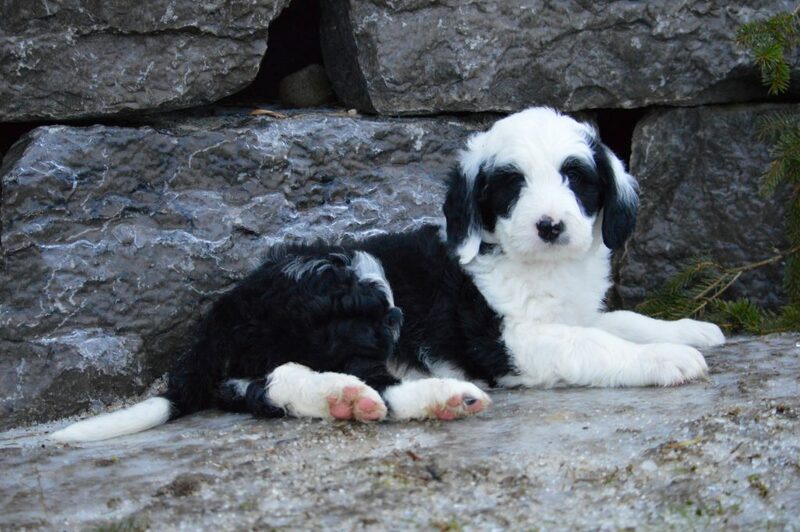 Our Standard Sheepadoodle puppies are priced at $2,500 CD taxes included. 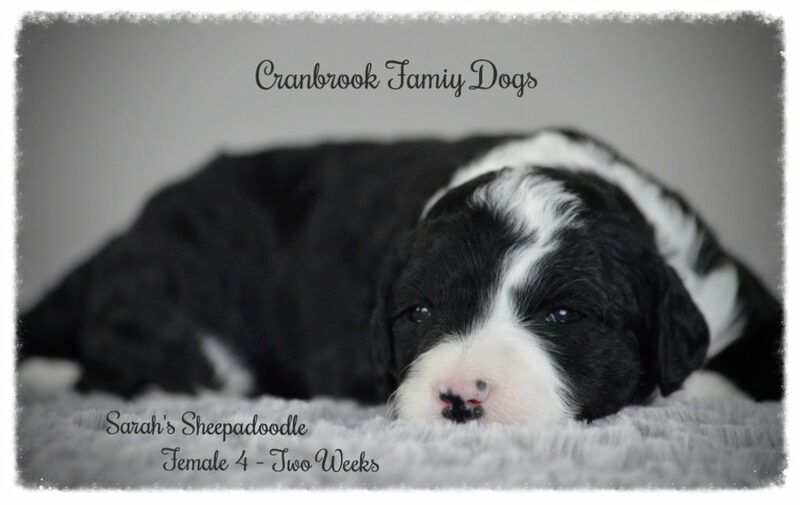 Deposits are $500 and go towards puppy purchase. 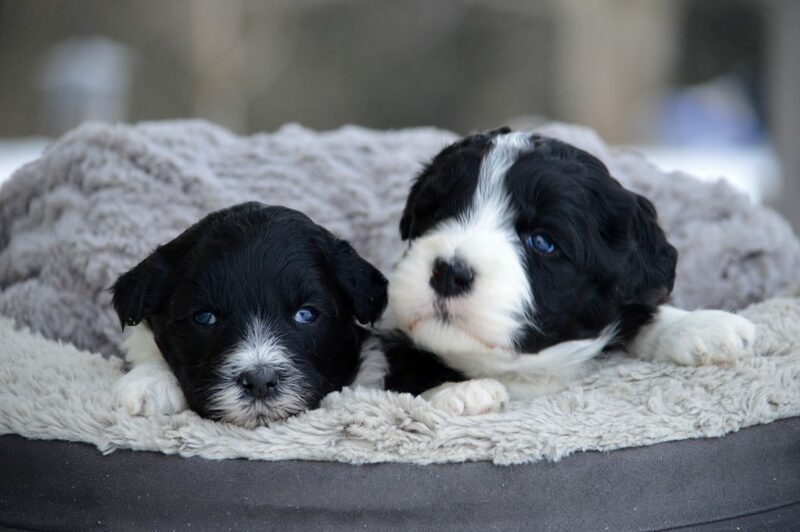 These puppies are ready for their homes February 9, 2018 or after. 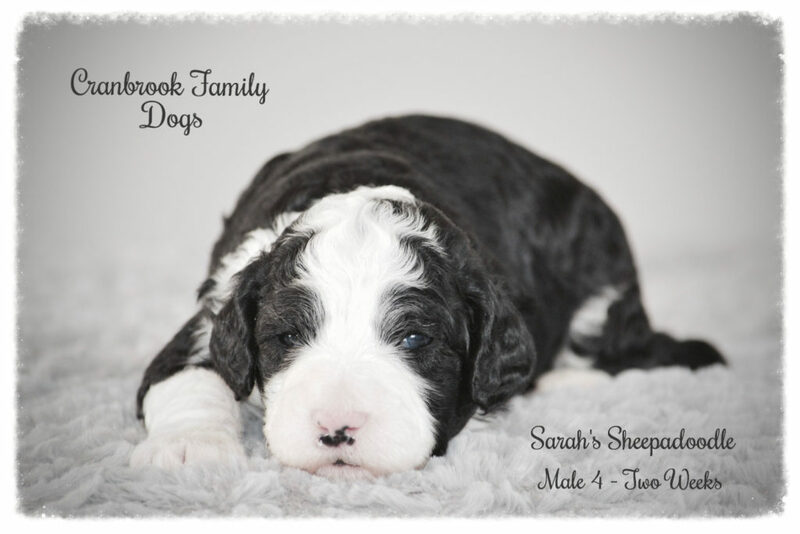 Sarah and Bruno have 8 beautiful puppies! 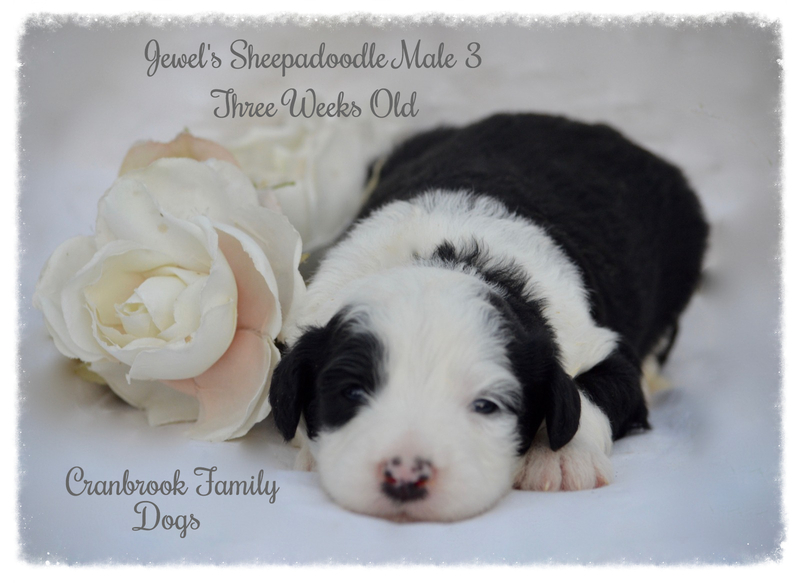 We have 2 boys and 6 girls in their litter. These pups will have black and white wavy coats and should mature to around 50-70 lbs matured. 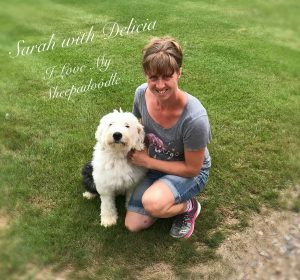 Sarah is a very affectionate with her people. 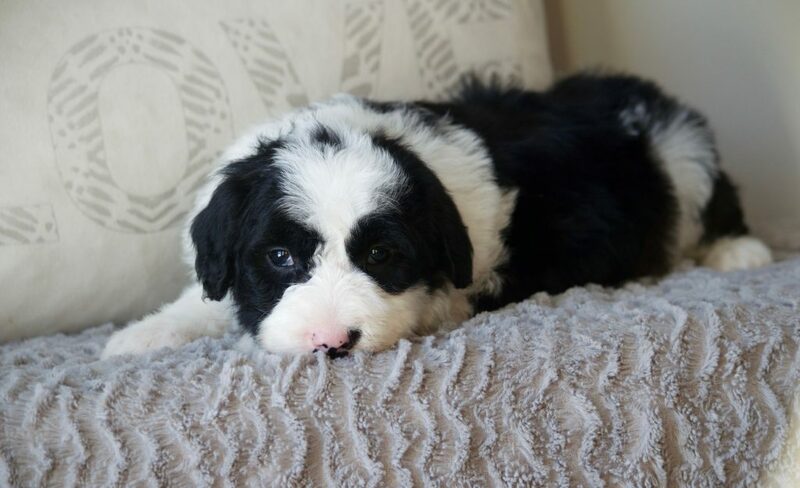 Bruno is calm and easy going. 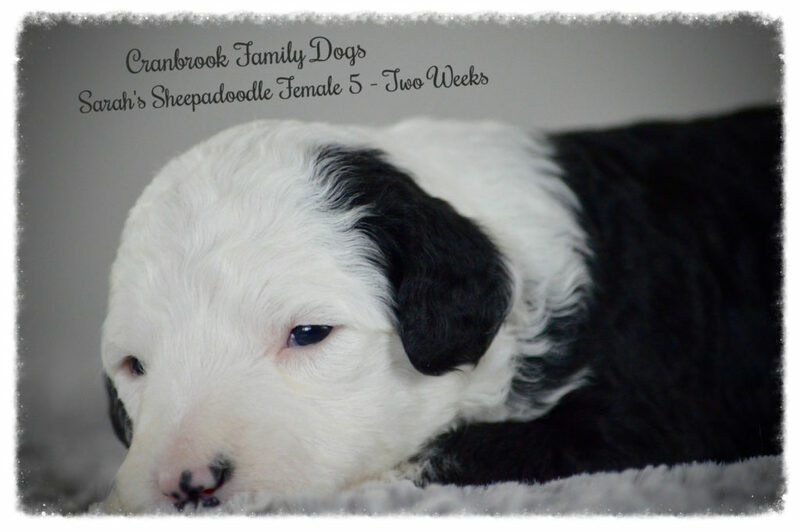 These pups will be ready to go to their new homes the end of July when they are 8 weeks old. 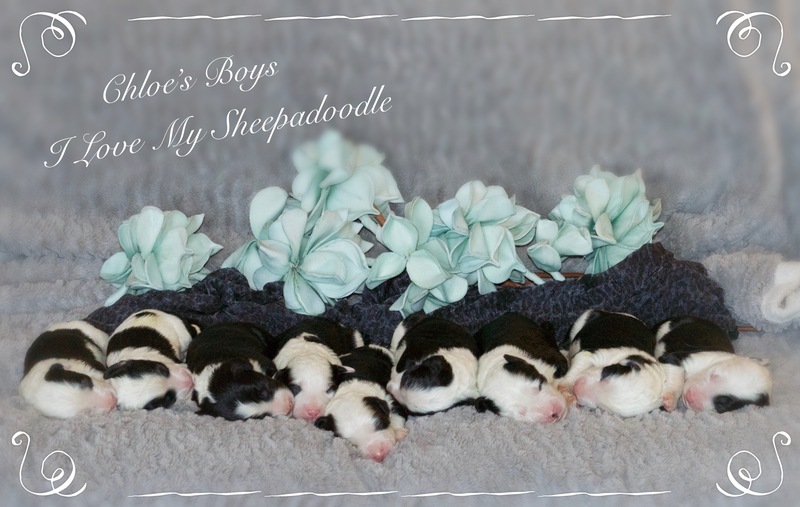 Twelve adorable little puppies were born Sunday afternoon on July 9, 2017. 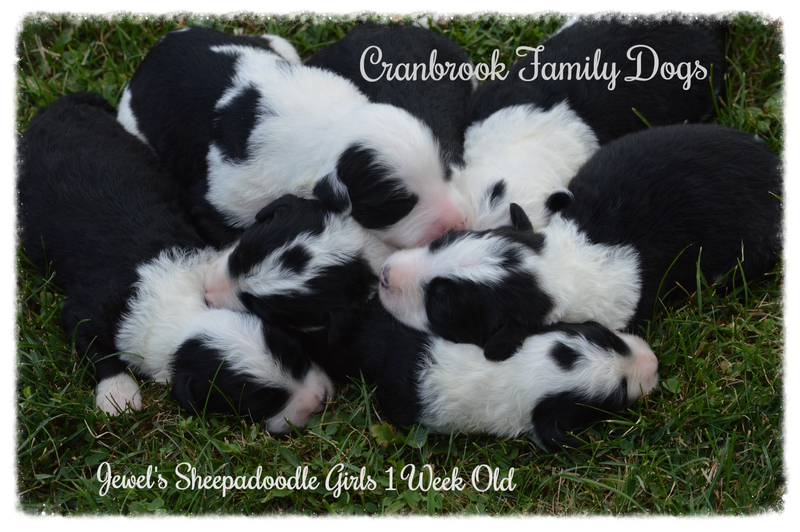 Seven boys and five girls have graced their presence to this earth. 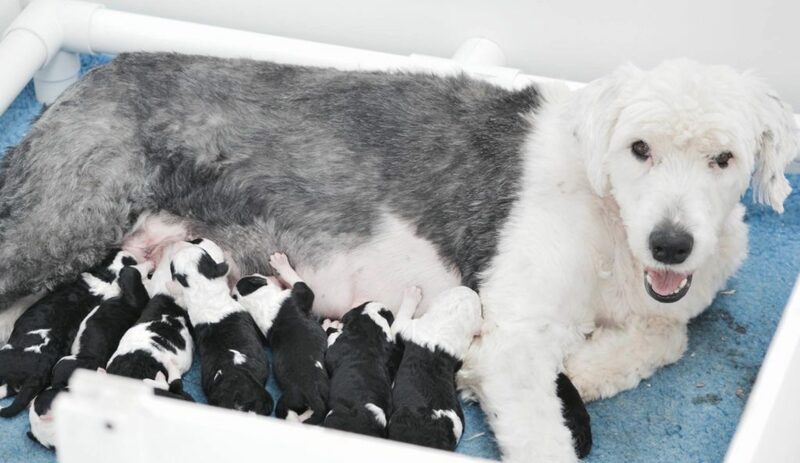 Missy and puppies are doing well. 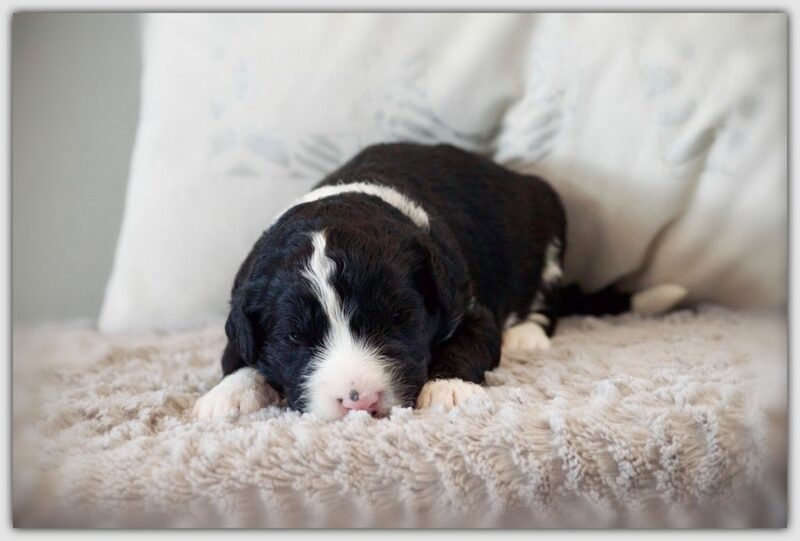 They love the fleece bedding in their whelping area as it keeps them cozy, dry and warm. 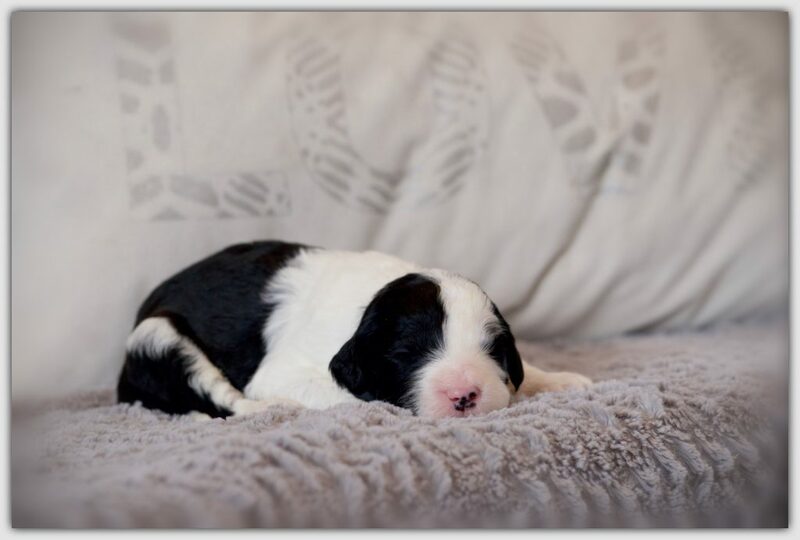 We will start working out puppy picking around 5 weeks of age for those on the waiting list. 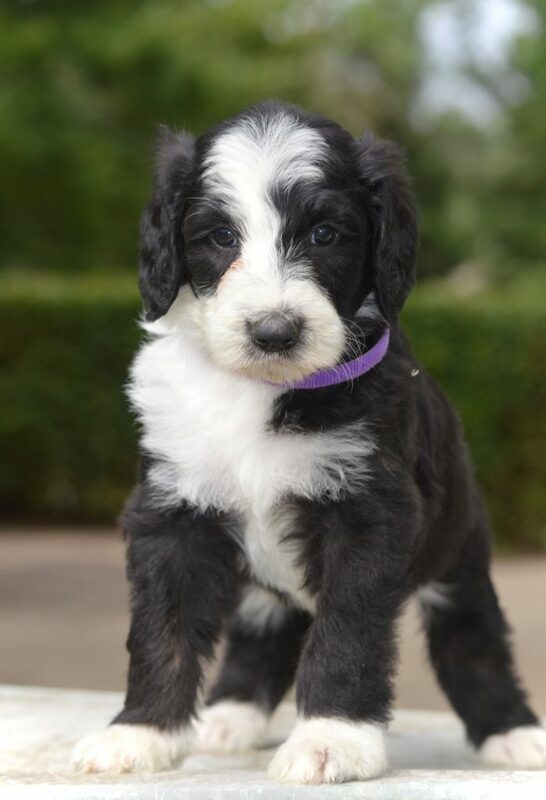 Pictures arriving soon! 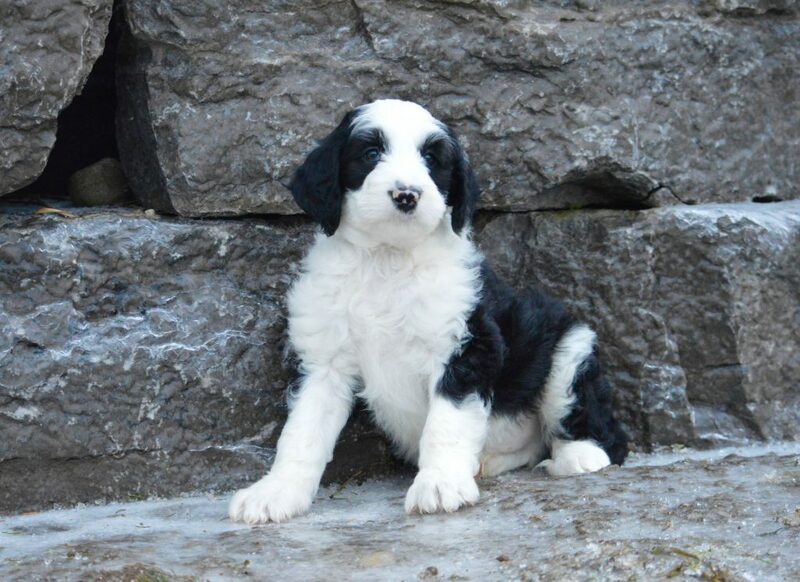 This is Missy x Jake’s second litter together. 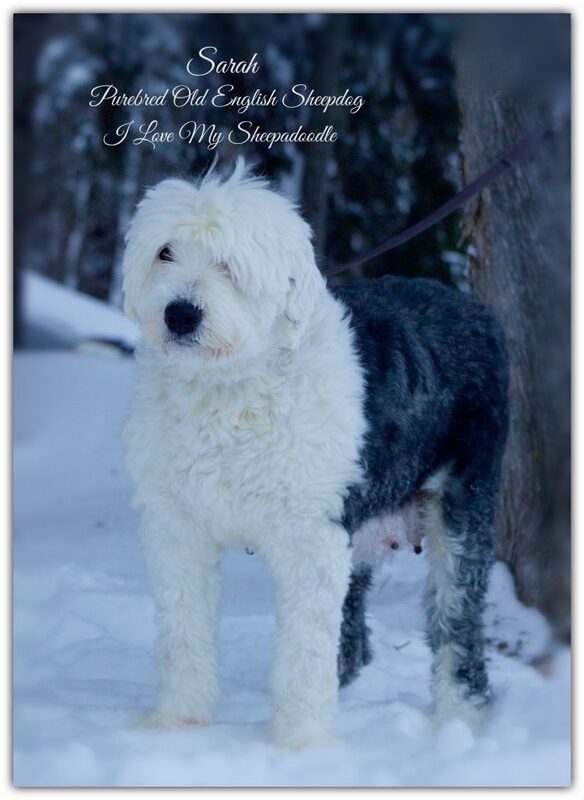 They have produced lovely standard Sheepadoodles in the past. 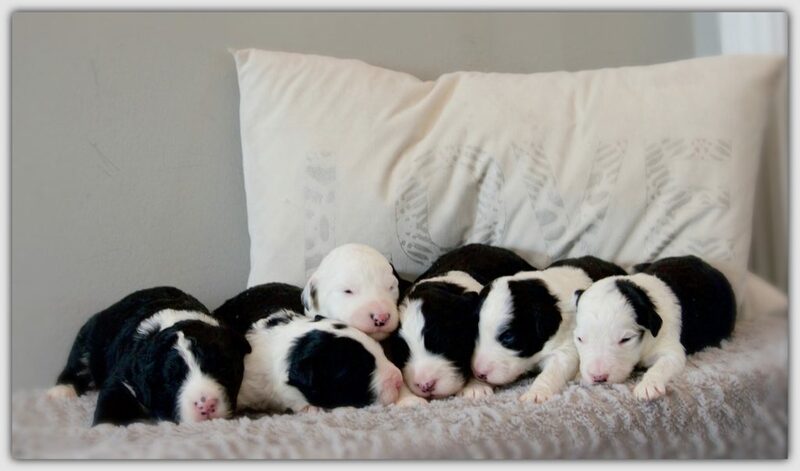 All of these pups have tuxedo coats with either white face or patch on one or two eyes. 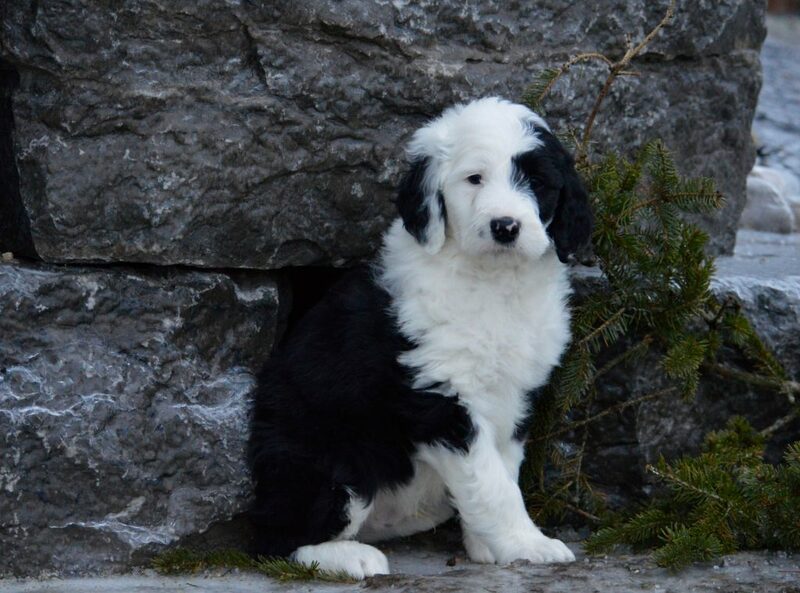 The puppies will be born with black and white coats but I expect the adult coats to transition into the blue grey and white like the OES. 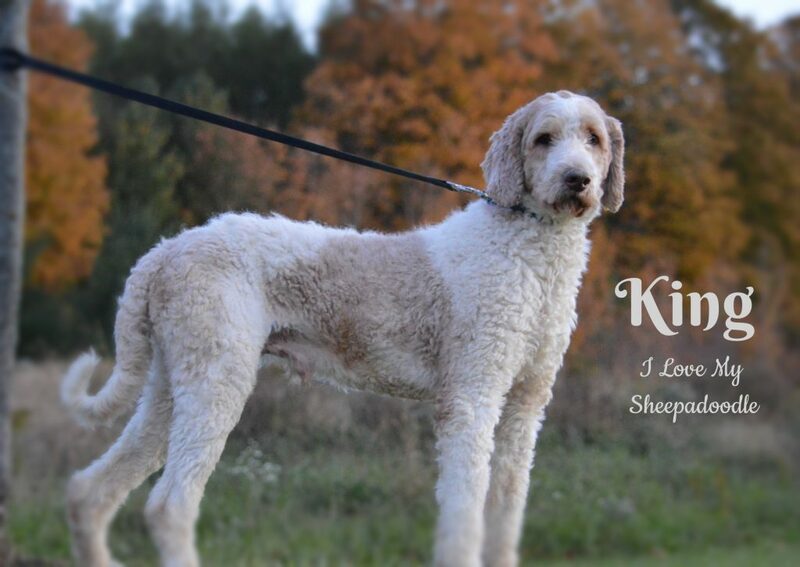 Missy is a gentle calm dog and soaks in attention from anyone! 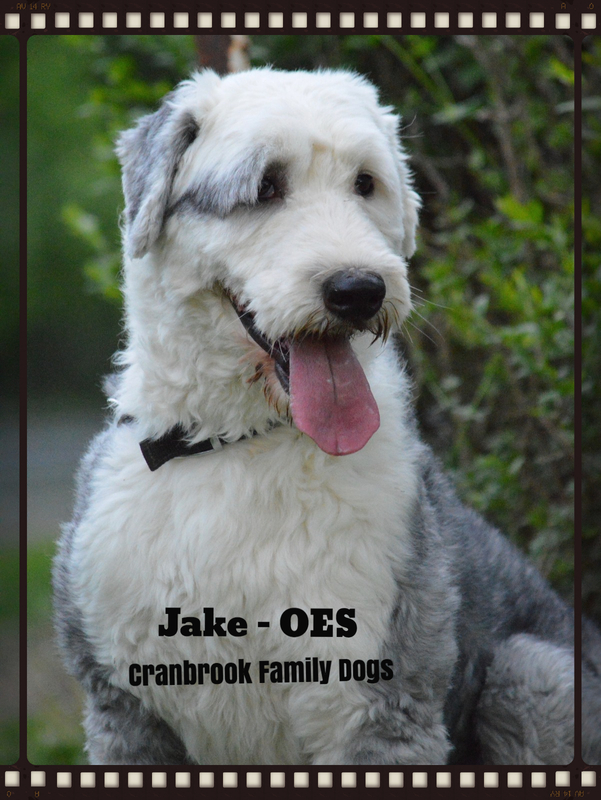 Jake is friendly and confident yet has a submissive personality to people and other dogs. 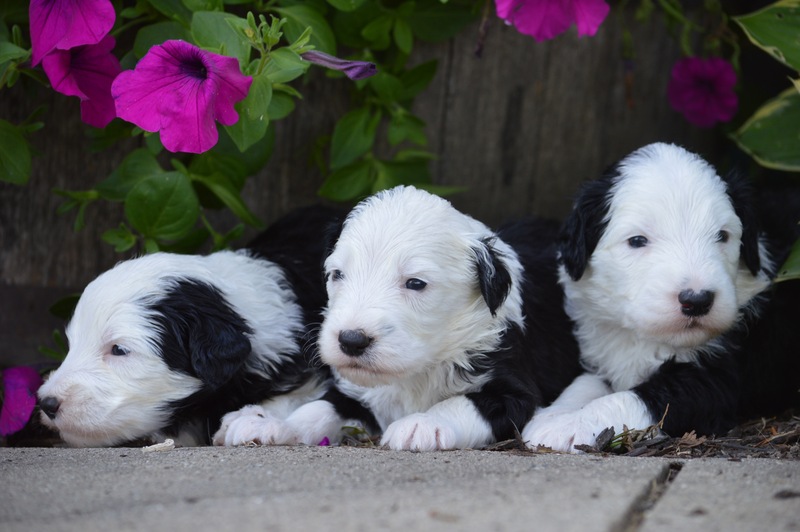 These puppies should have desirable temperaments for a family dog. 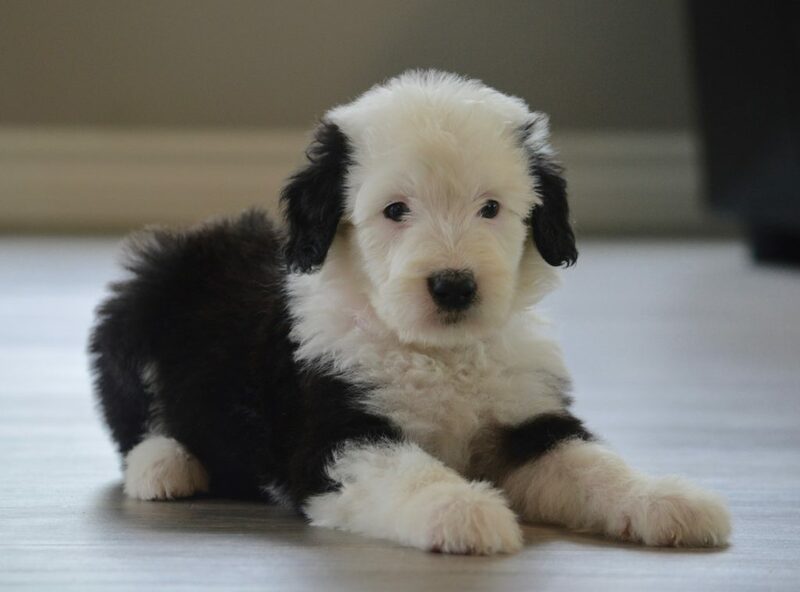 Puppies should be ready for their new homes at 8 weeks of age the beginning of September 2017. 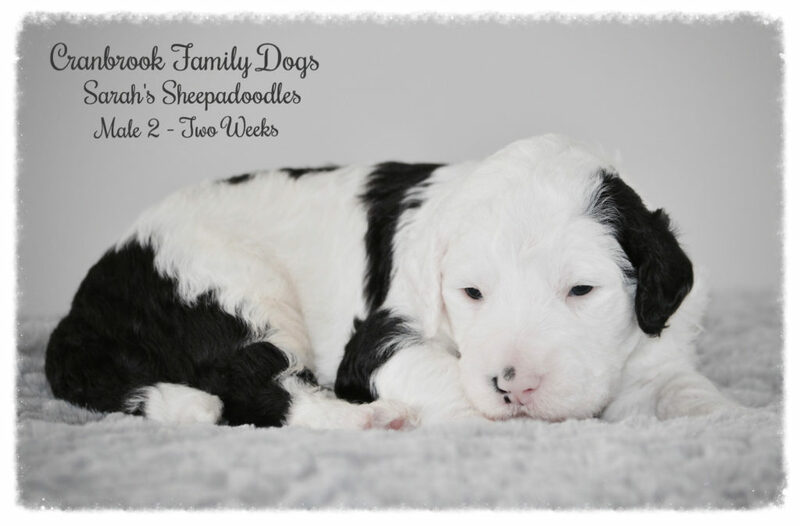 Sarah & Bruno produce F1 Sheepadoodles with a soft wavy coat. 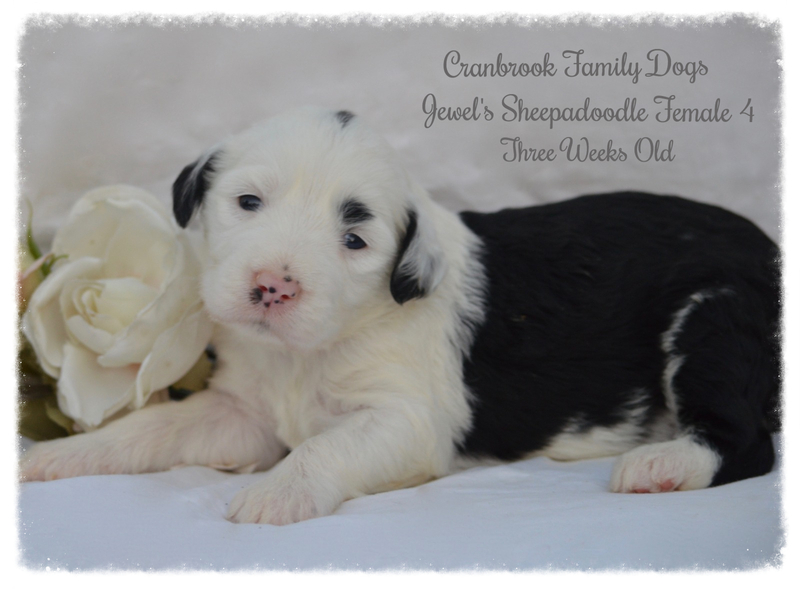 They also have lovely markings with patches on one or both eyes. 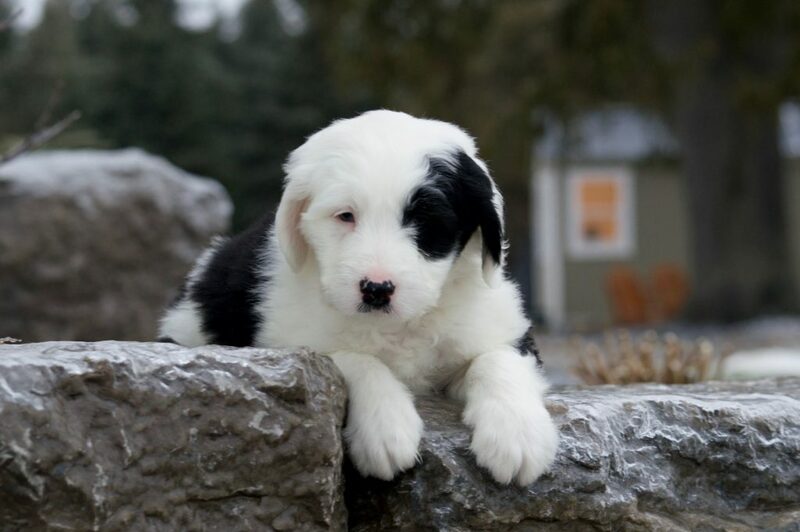 There are a few white faced pups as well! 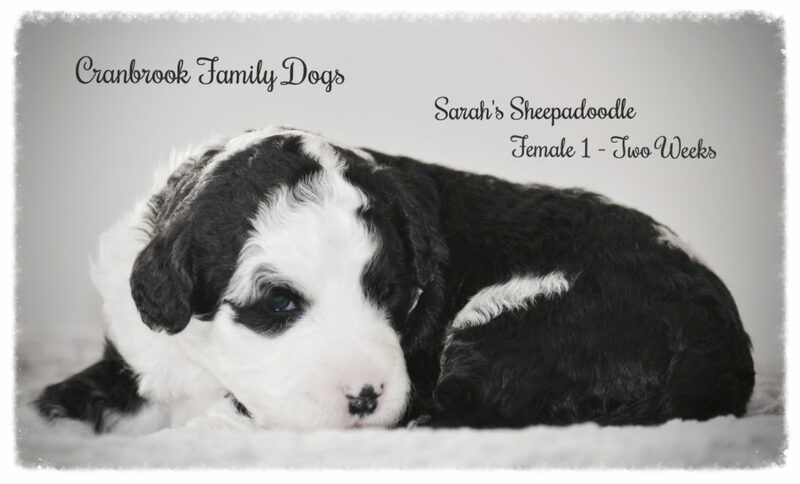 Both Sarah and Bruno are affectionate and very friendly, so you should have a wonderful companion out of this litter! 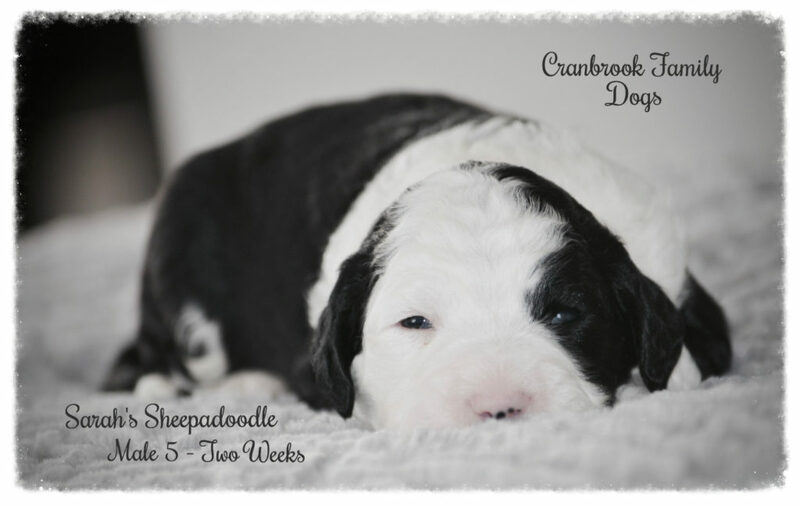 These pups are a smaller sized Standard Sheepadoodle. 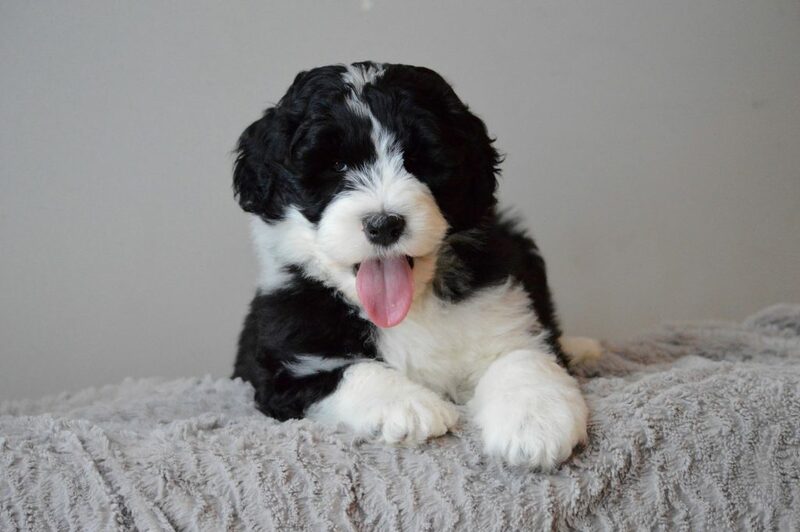 Puppies ready to go home beginning of June 2017. 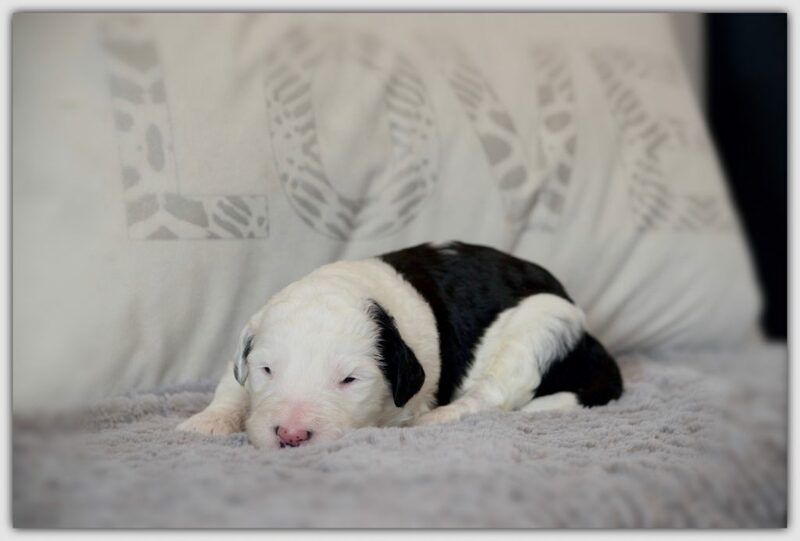 All pups are reserved.